The goal of Optimising Nutrition is to help you design the minimum effective dose of nutrition to support your goals (e.g. performance, weight loss, diabetes management, therapeutic ketosis, bodybuilding, etc.). enables you to maintain healthy hormone levels. Unfortunately, talking about “high”, “low” or “adequate” often leads to unproductive circular arguments due to a lack of definition. 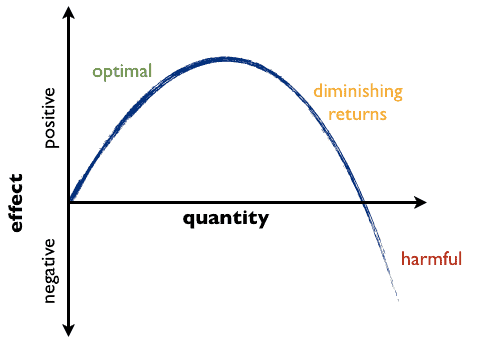 Optimal typically lies somewhere between the extremes. A ‘Goldilocks zone’ of not too little. Not too much. A ‘minimum effective dose’ if you will. If we want to design the minimum effective dose (MED), we need to understand which parameters have the most significant impact on the quality of our nutrition. With all the discussion about ‘high,’ ‘low’ and ‘not too much’ we need to understand the acceptable range for each of the key parameters to ensure we don’t stray too far from optimum. What is the ‘minimum effective dose’? The ‘minimum effective dose’ (MED) is the smallest dose that will produce the desired effect. In terms of medication, the MED is the minimum amount that will give the desired effect for most people. Too much of a drug can be expensive and harmful. Too little won’t have the enough of an effect. In fitness, the minimum effective dose is the point beyond which any additional stress would be redundant or even counterproductive to strength and fitness goals. In biohacking, the MED is about getting the desired outcome with the minimum investment of time, money or effort. 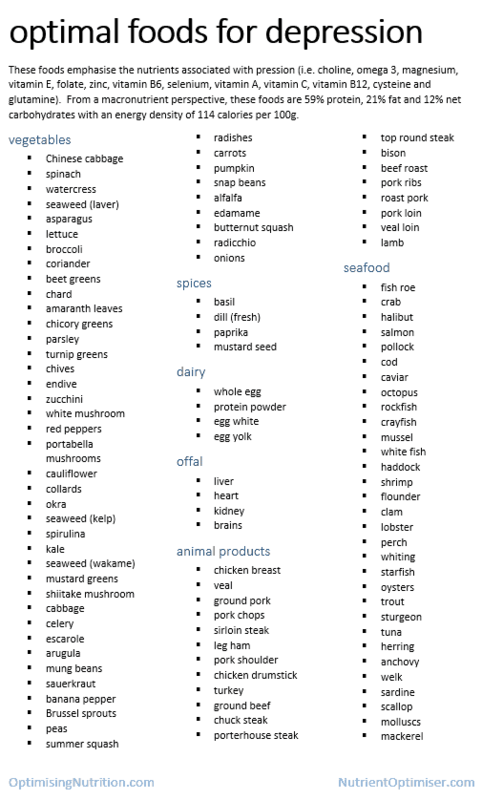 What does MED mean regarding nutrition? There are a handful of interacting factors that help us determine the minimum effective dose of nutrition. Unfortunately, it’s not possible to optimise all parameters at once. We need to decide which ones we want to prioritise and which ones we are prepared to sacrifice based on our context and goals. Before we get into the details of how we determine the MED of nutrition, let’s set the context with a review of some parameters. 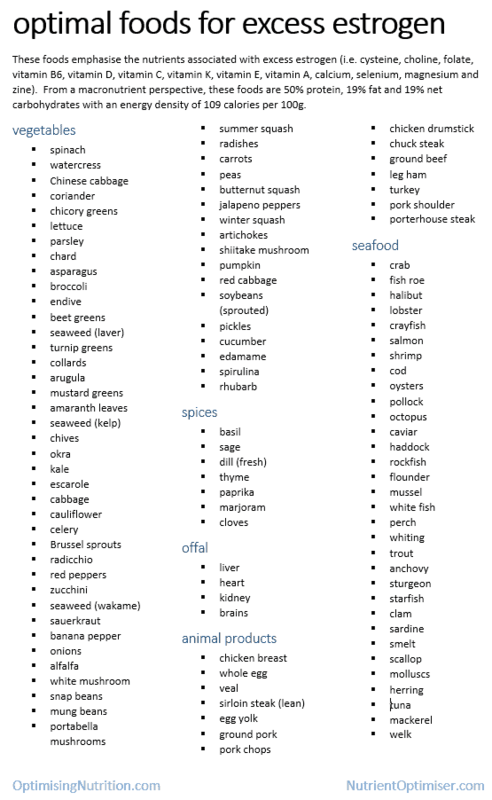 The body needs a range of essential nutrients and benefits from an even more extensive range of non-essential nutrients. Recommended Dietary Intake (RDIs) or are given as the minimum amount to prevent diseases of malnutrition for most people (i.e. not necessarily optimal health and longevity). 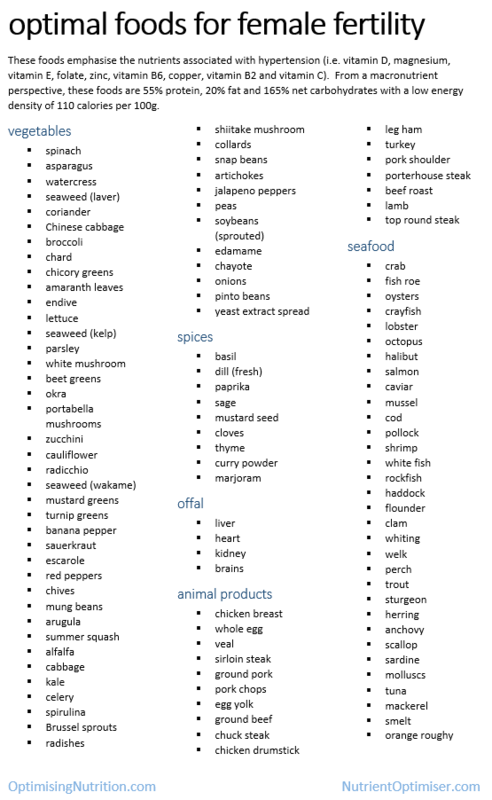 Nutritional requirements vary due to a wide range of factors. Men need more than women (unless they are pregnant or breastfeeding). Many nutrients are easy to obtain, but we need to pay particular attention to getting adequate quantities of others. 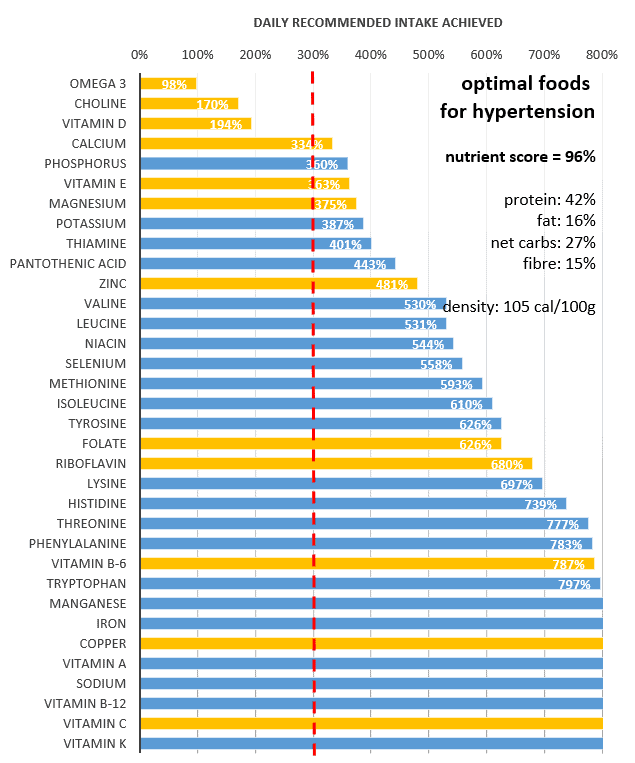 If we are obtaining the recommended minimum levels for the majority of the essential nutrients, we are likely to significantly exceed the Recommended Daily Intake for a number of these nutrients. 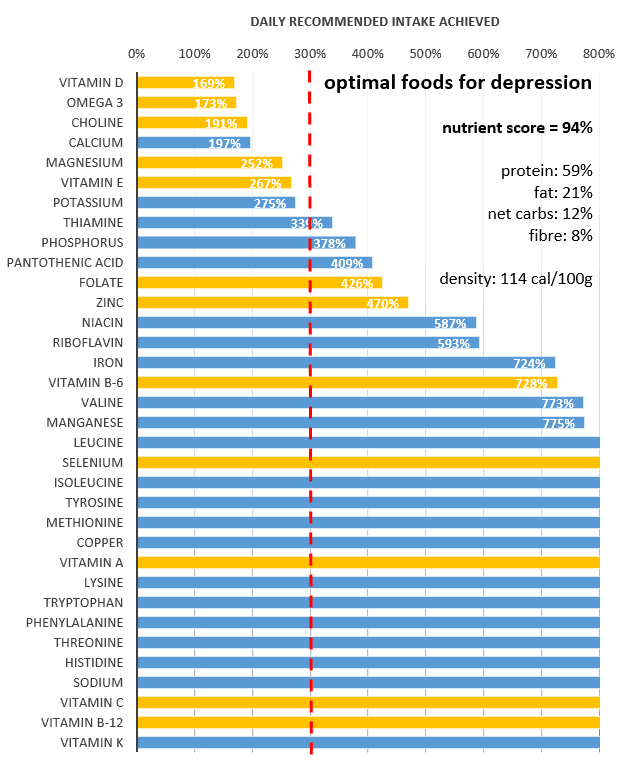 We tend to get a better nutritional outcome when we prioritise the foods that contain the harder-to-find nutrients, and the other nutrients tend to look after themselves. 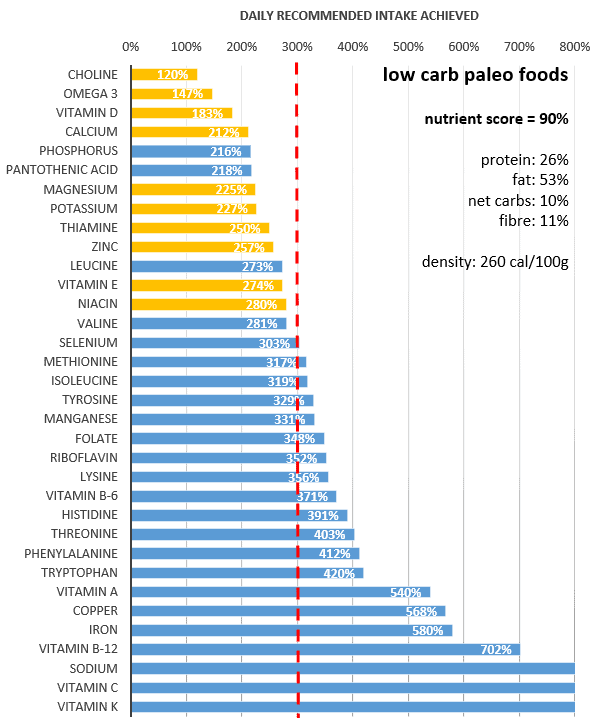 The upper limit (UL) for most nutrients is difficult, if not impossible, to exceed without supplementations (except for those Arctic explorers that gorged on polar bear liver and felt ill due to hypervitaminosis). 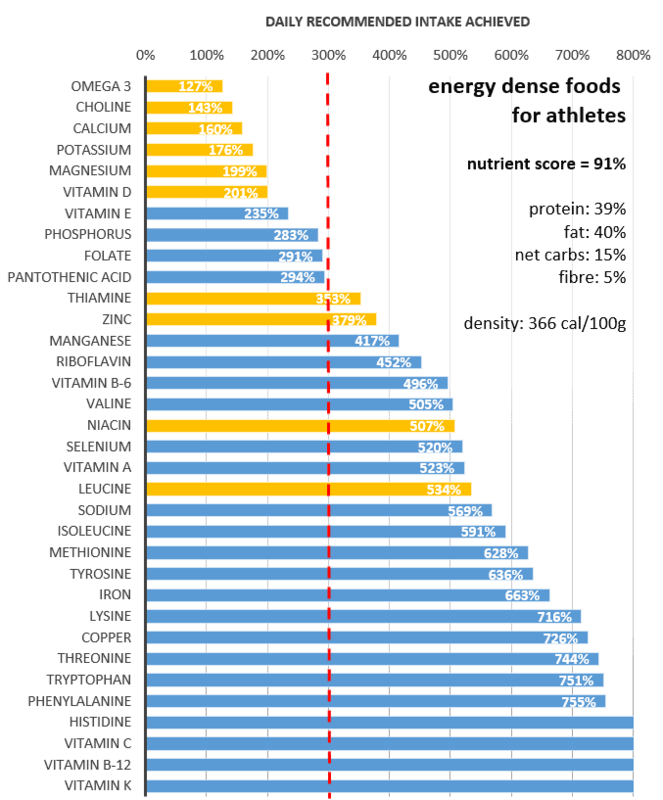 If you are an athlete, you will need more nutrients. However, you will be able to consume a lot more energy, thus letting you achieve the minimum intake level for most nutrients rather easily. At the other extreme, if you are restricting energy to lose weight, it may be hard to get enough nutrients from the food you eat. Focusing on foods with a high nutrient : energy ratio will be critical. a nourishing, balanced diet that provides all the required nutrients in the right proportions is the key to eliminating hunger and minimising appetite and eliminating hunger at minimal caloric intake. Bruce Ames’s Triage Theory warns that the body will prioritize available nutrients for short-term functions and at the expense of longevity where nutrients are limited. Francis Pottenger demonstrated that poor nutrition has generational impacts with his cats that progressively became more deranged to the point that they couldn’t procreate after three generations. Maximising the nutrient content of our diet with the minimum amount of energy seems to be central to our short-term and our long-term health! The Protein Leverage Hypothesis shows that we keep eating until we get enough protein. A pregnant woman will crave weird foods and obscure flavours to ensure she’s getting the nutrients to grow a healthy baby. As you will see below, nutrition and protein are tightly interrelated. Rather than the ‘Protein Leverage Hypothesis’, I think it’s reasonable to think that there is a ‘Nutrient Leverage’ effect such that we seek out more food until we get the nutrients we need. It’s not unreasonable to think that getting adequate nutrients from the food we eat is a critical component of our satiety mechanism and managing our appetite. If we don’t obtain sufficient nutrients from our food, we will be more likely to seek out more food in search of nutrients, and thus end up over-consuming energy and become obese and/or diabetic. While we have developed our appetite to seek out foods that contain the nutrients we need, our drive for energy is even stronger. 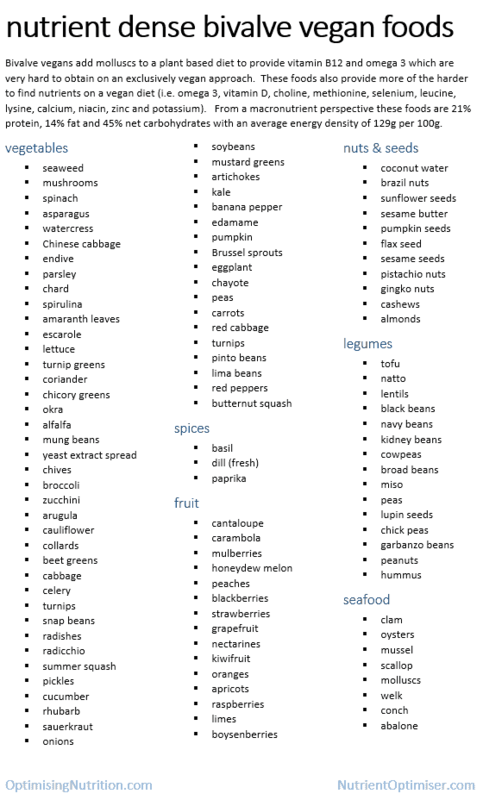 Adapted biologically to scarcity, we tend to consume a little more energy than we need in preparation for leaner times. However, today in our modern processed food environment with fossil fuels, chemical fertilisers, and artificial flavourings, winter never comes. Before the advent of processed foods, energy always came packaged with adequate nutrients. However, this is no longer always the case. To thrive in our modern world with primal instincts, we need to find a way to reverse-engineer our food environment to ensure that we prioritise foods with the nutrients we require without too much energy. 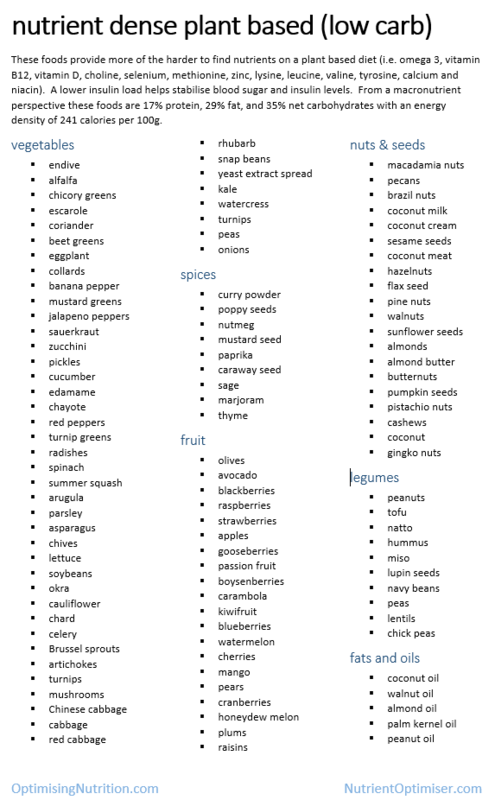 Perhaps we need a shortlist of optimal foods and meals that will provide the minimum effective dose of nutrients that we require without having to consume excess energy. Insulin is arguably the most important metabolic hormone that helps us build muscle, use glucose and keep stored energy locked away for a later day. Adequate levels of insulin are critical to survival. People with Type 1 diabetes die without insulin. However, today’s processed foods tend to drive our insulin levels too high for too long, thus leading to insulin resistance and the majority of modern disease. Low carb and ketogenic diets help us bring insulin and blood sugar levels under control. At the same time foods with an extremely low insulin load are tend to be mostly fat and do not contain the vitamins and minerals that we need. We need to balance the reduction in insulin load that will help us stabilise blood sugars and insulin levels in our body without excessively and unnecessarily compromising nutrient density. 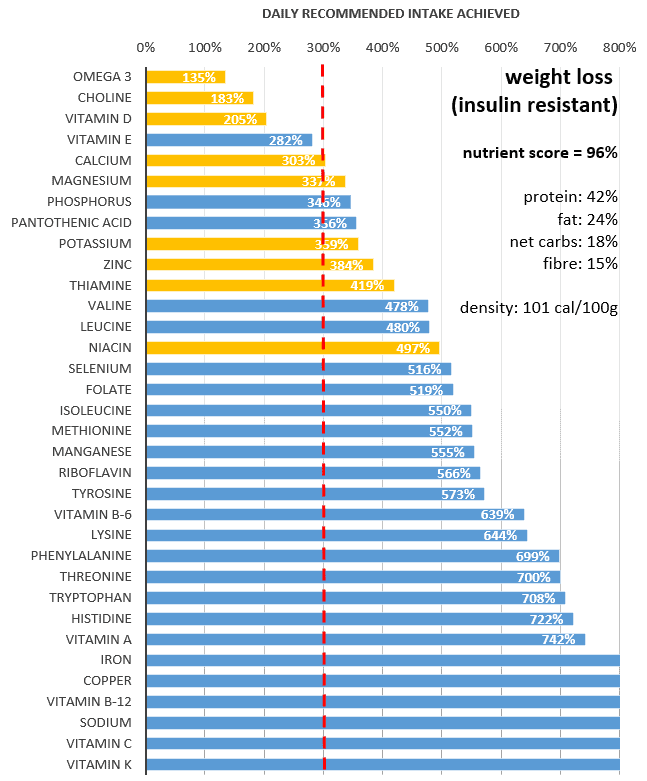 The table below shows the Acceptable Macronutrient Distribution Range for macronutrients to reduce chronic disease risk whilst still ensuring adequate micronutrient status along with the currently typical macronutrient” according to the Institutes of Medicine (IOM) . 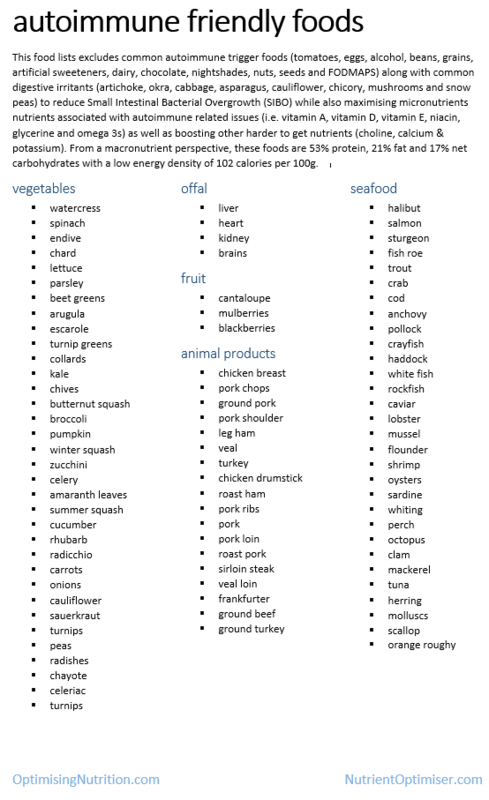 The Australian Ministry of Health notes that only 10% of energy is required from protein to cover physiological needs. However, this level is insufficient to provide adequate micronutrients levels. Active communities have much higher protein intake levels with no apparent adverse health effects. The chart below shows that our carbohydrate intake is trending up while fat has trended down as we have followed the official guidance to avoid fat to avoid heart disease over the past four decades. 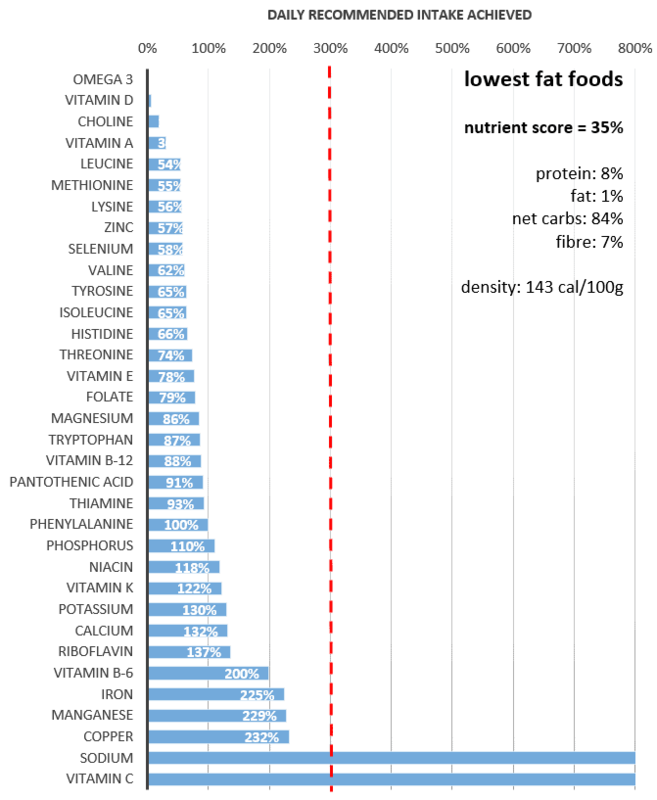 The table below shows the typical macronutrient intake for the US, UK and eighteen non-Asian countries from the PURE study. A number of people such as Gary Taubes and Nina Teicholz have argued that the unnecessary fear of fat and retreat to processed carbohydrates has contributed to the obesity epidemic. One of the main goals of this article is to consider whether the ‘Acceptable Macronutrient Ranges’ set by the Institute of Medicine actually allows us to optimise nutrient density. 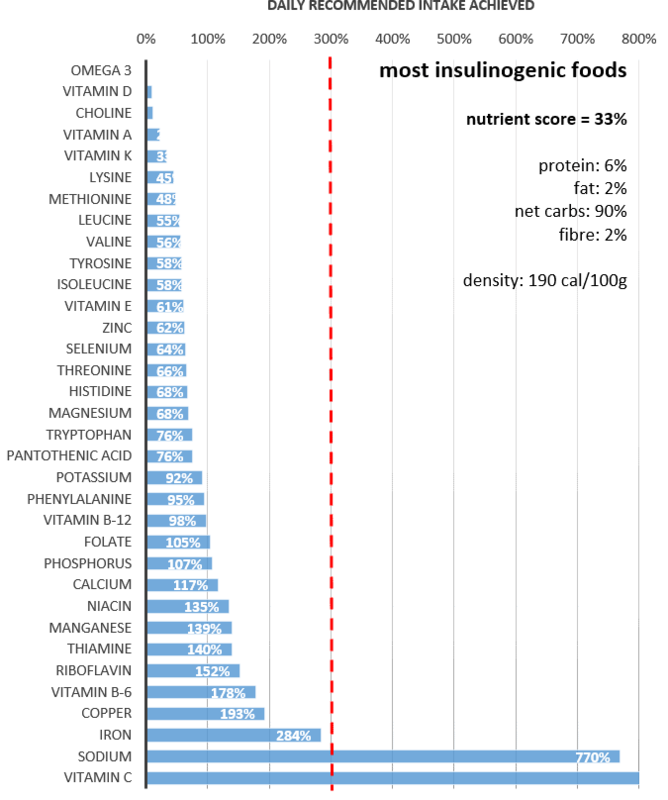 I’ve previously discussed the relationship between macronutrients and the nutrient density of individual foods (see Micronutrients at Macronutrient Extremes and Which Nutrients is YOUR Diet Missing?). 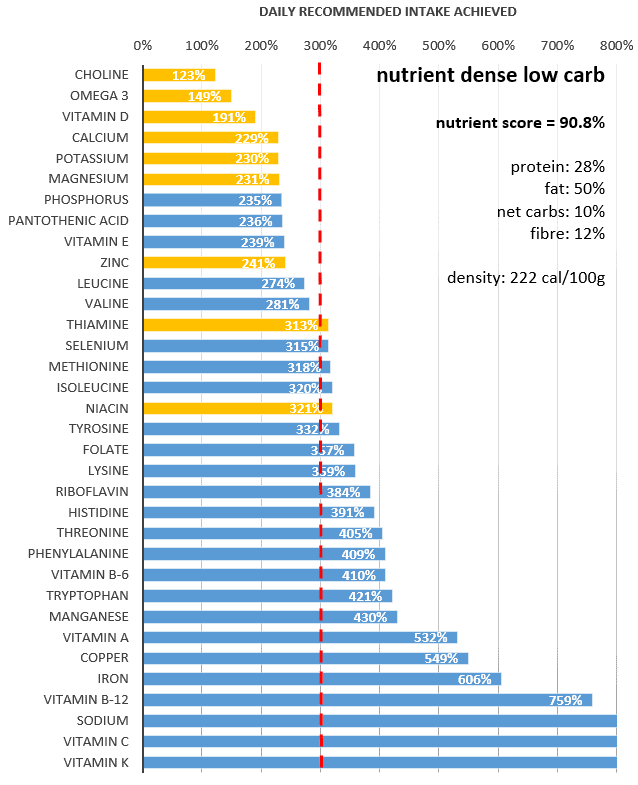 However, I thought it would be interesting to look at things in terms of the nutrient score for each nutritional approach. 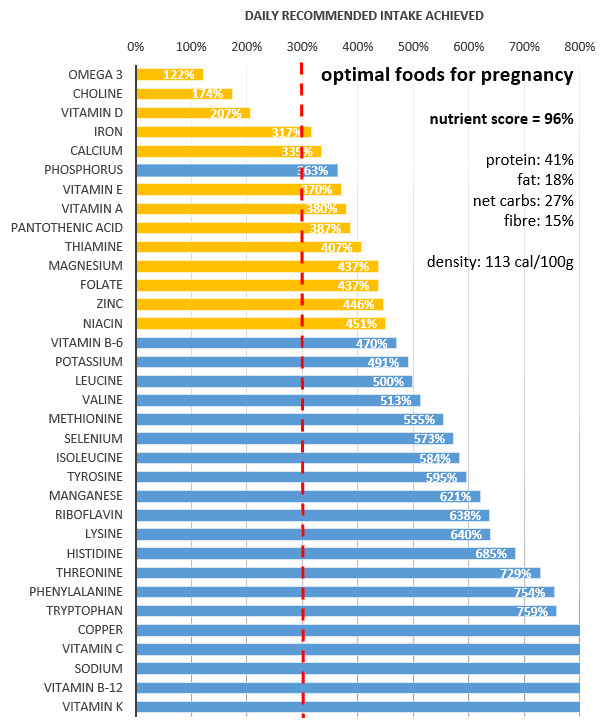 To understand the relationship between nutrition and various food parameters I updated the analysis for a wide range of nutritional approaches as shown in the table below (sorted in descending order for nutrient density). 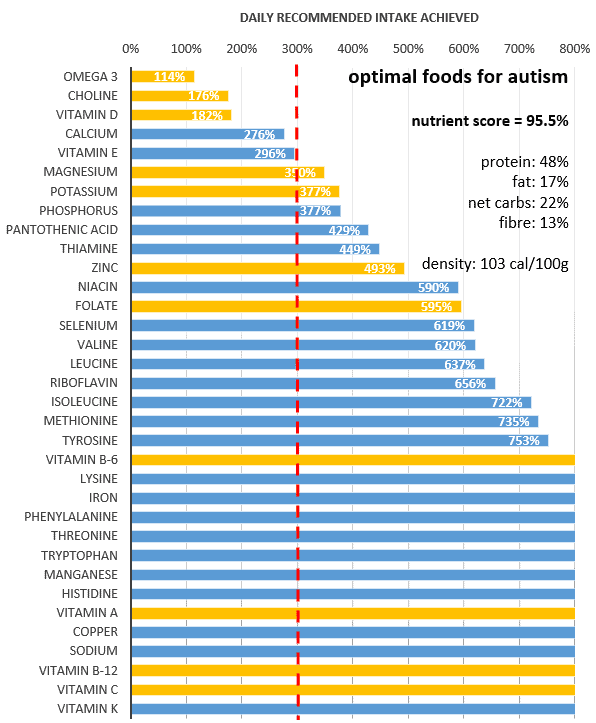 The table below shows the nutrients provided by 43 different nutritional approaches along with the shortlist of foods associated with each goal. (This took me a LOT of time to re-run, so I’d love you to check it out). 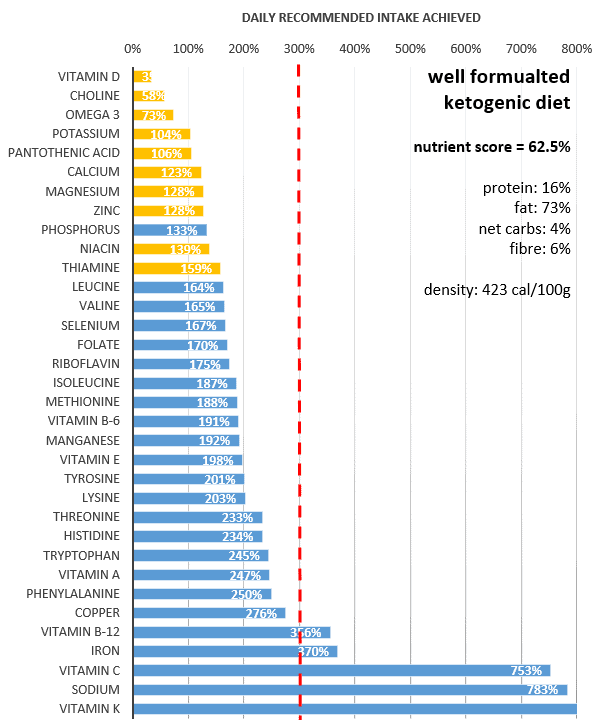 This table shows the macronutrient split of each of these approaches. 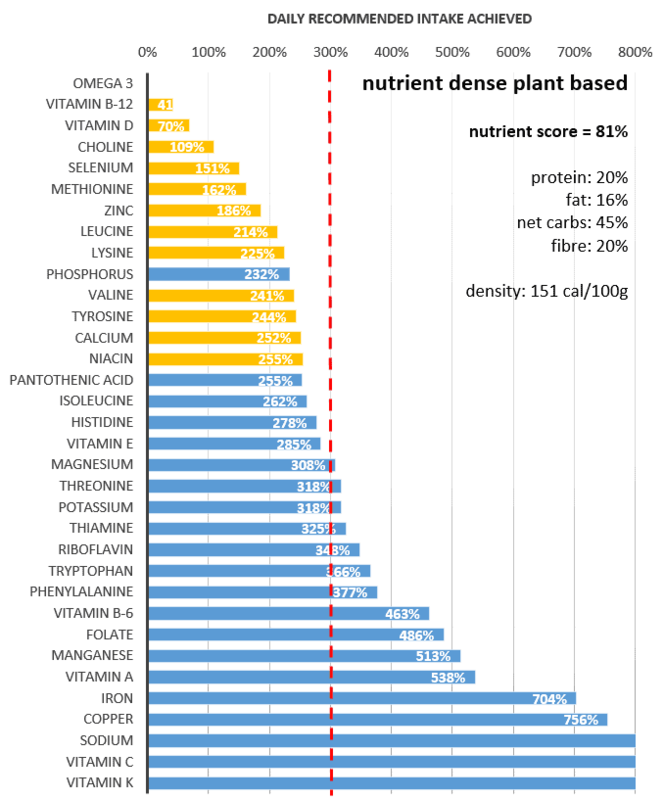 To make sense of all this data, I have plotted each these parameters against nutrient density and included some discussion on what I think this means in the following sections. 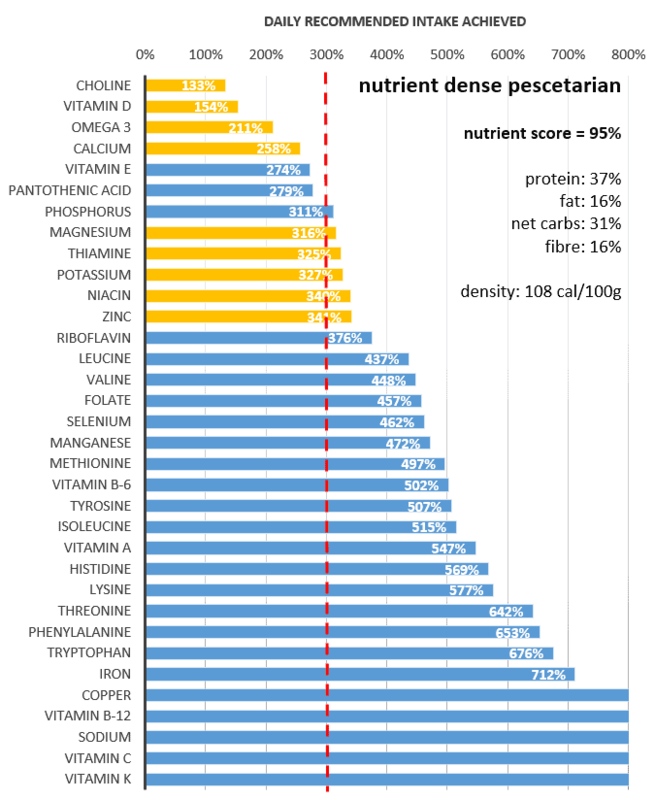 The table below shows the correlation coefficient between nutrient density and each of the parameters along with the P value indicating that there is a reasonable degree of statistical significance. 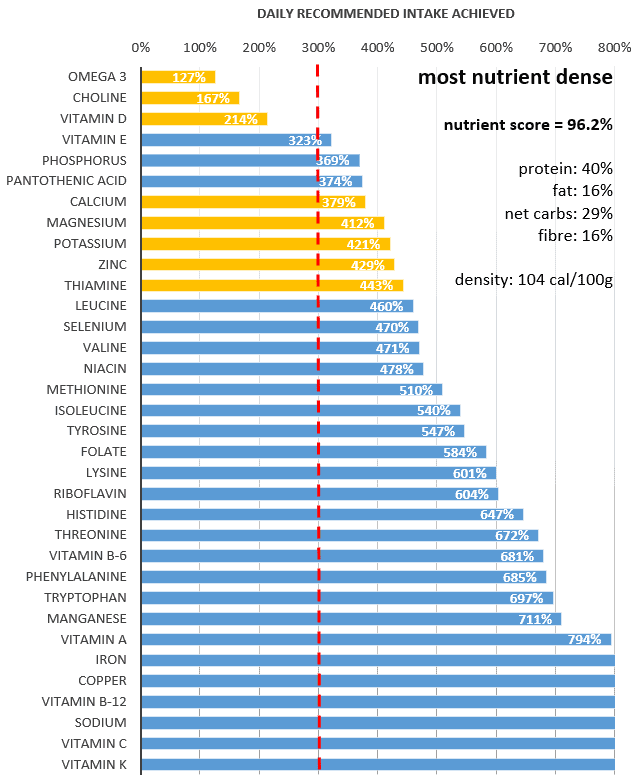 Given that protein has the highest correlation with nutrient density score (R2 = 0.89) let’s start by looking at the relationship between protein and nutrient density. 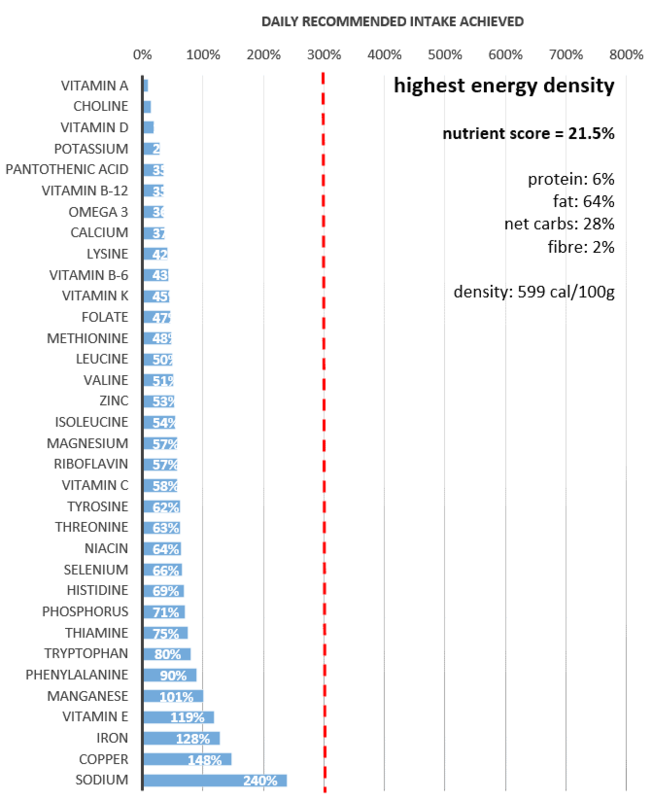 The chart below shows the relationship between the nutrient density score and the percentage of energy from protein. 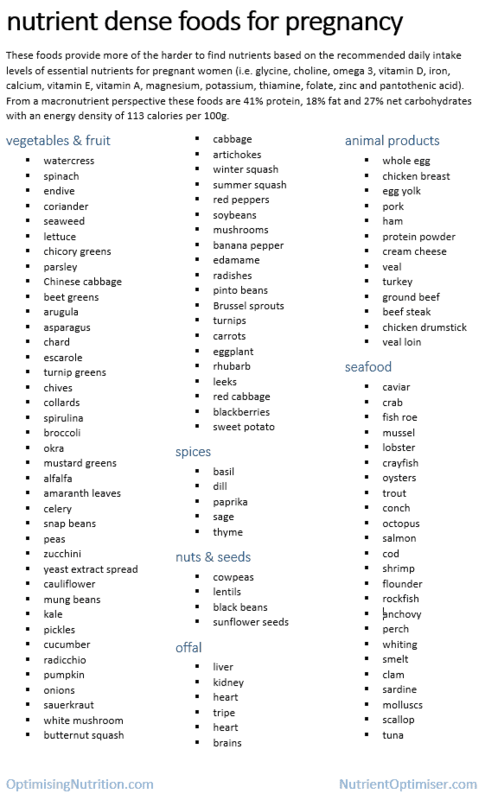 It seems that nutrient density peaks in around 45% of calories from protein. 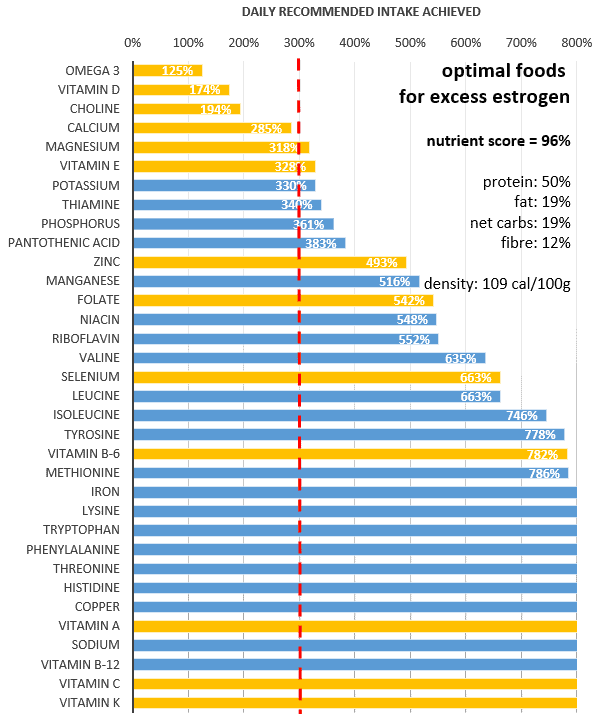 If we were to use a nutrient density score of 70% as our cut off for our minimum effective dose of nutrition we would have a lower limit of 19% protein and an upper limit of 78% energy from protein. This optimal level is significantly above the typical protein intake of around 16% of energy and even greater than the upper end of the official Acceptable Macronutrient Distribution Range of 15 to 35%. 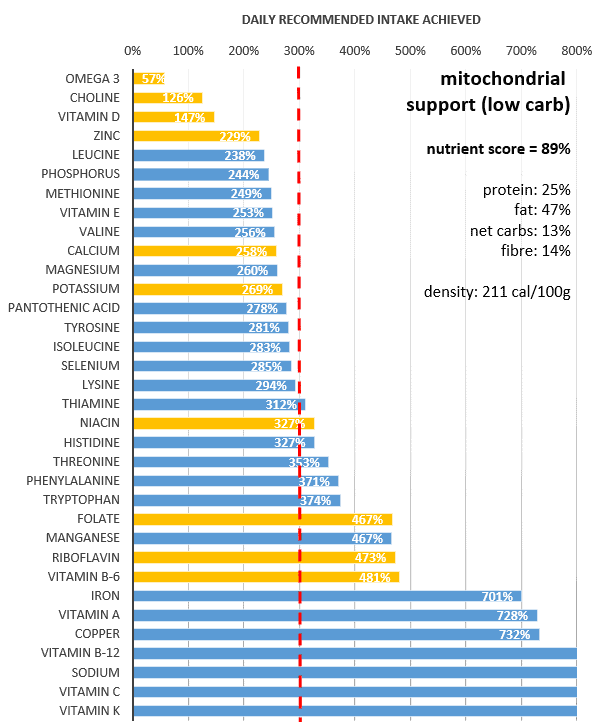 The chart below shows the micronutrients provided by the most nutrient-dense foods. 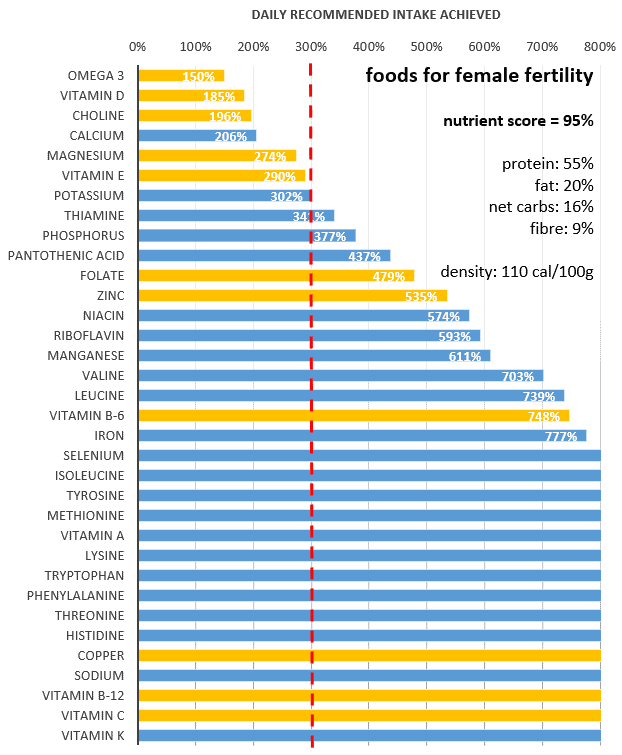 That is, the highest ranking 10% of foods in the eight thousand foods in the USDA food database when we boost the harder to find nutrients (shown in yellow). 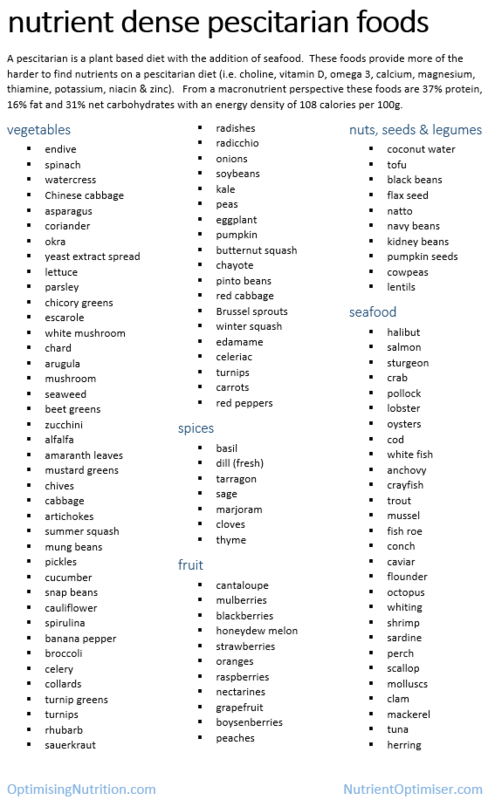 These foods provide the best balance of micronutrients to meet the Recommended Daily Intake Levels. 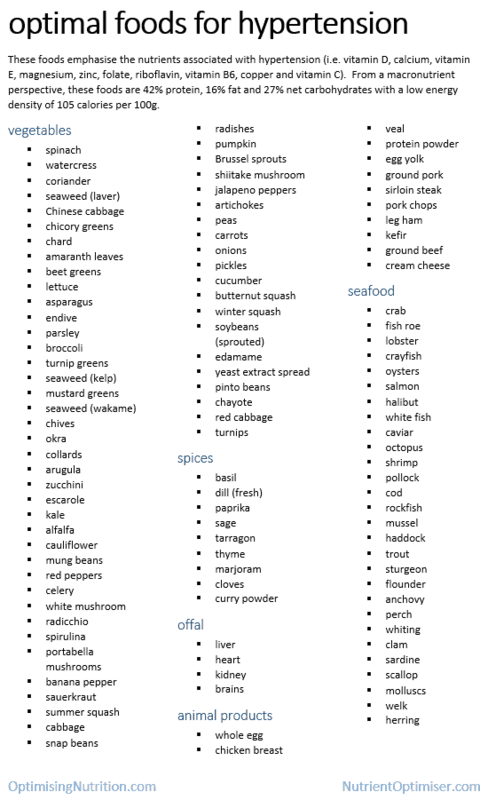 What’s worth noting here is that this shortlist of nutrient-dense foods are NOT identified by prioritising any of the amino acids. 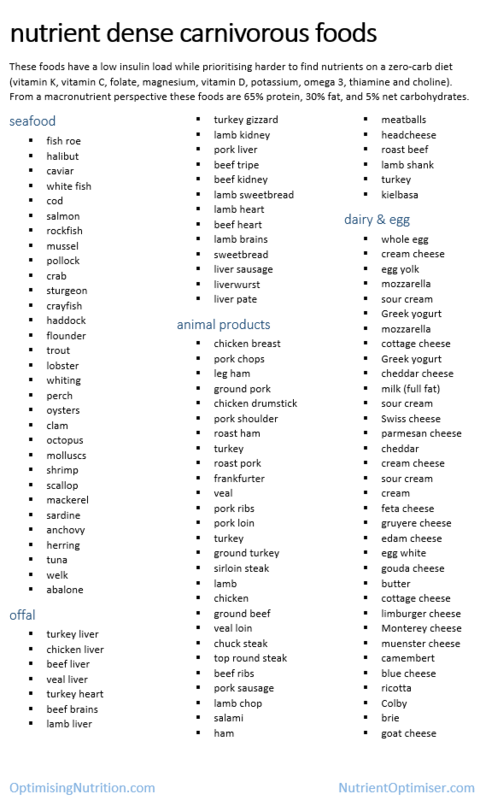 We just happen to get plenty of protein from foods that contain more of the harder-to-find nutrients (i.e. 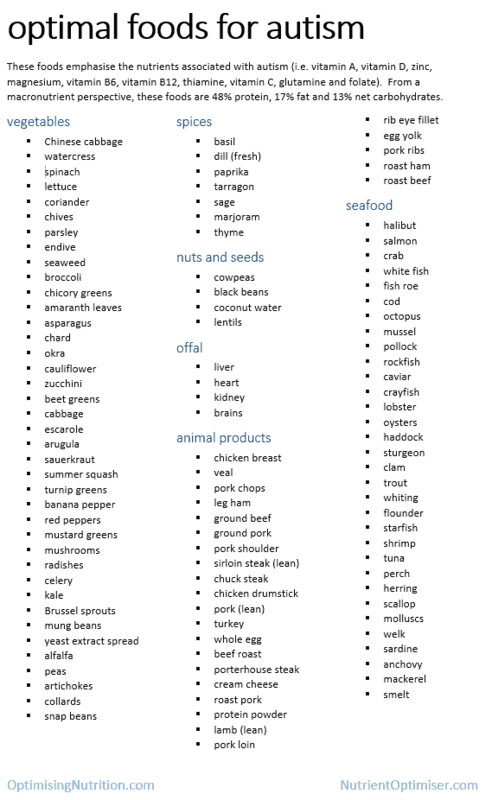 omega 3, choline, vitamin D, calcium magnesium potassium, zinc and thiamine). 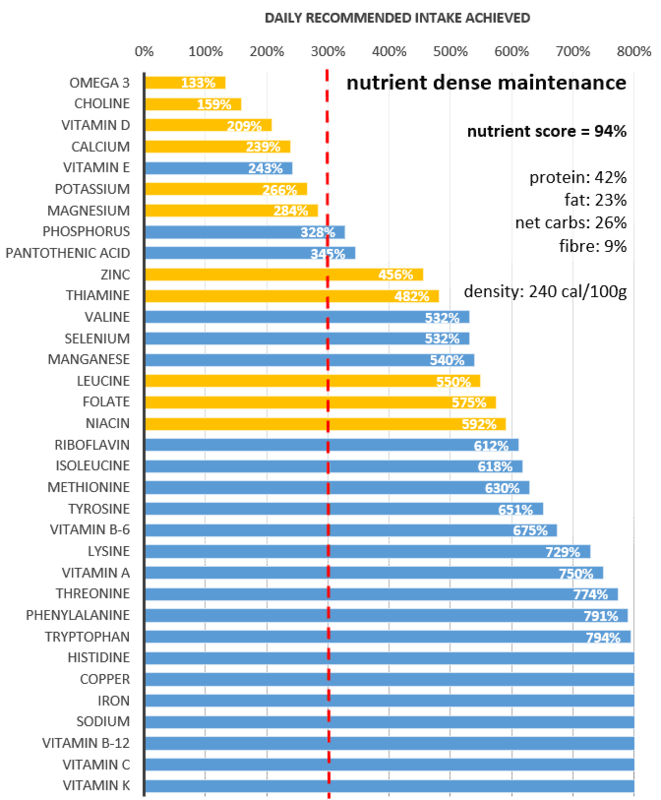 The nutrient score in this analysis is calculated based on the proportion of the area between 0 and 300% of the RDI for the various nutrients. 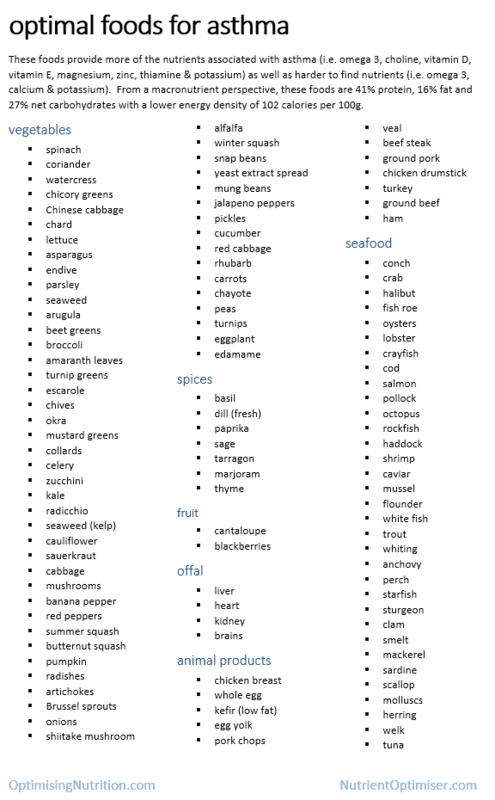 If we could find a group of foods that provided 300% of the recommended daily intake (RDI) of all nutrients we would get a perfect score. 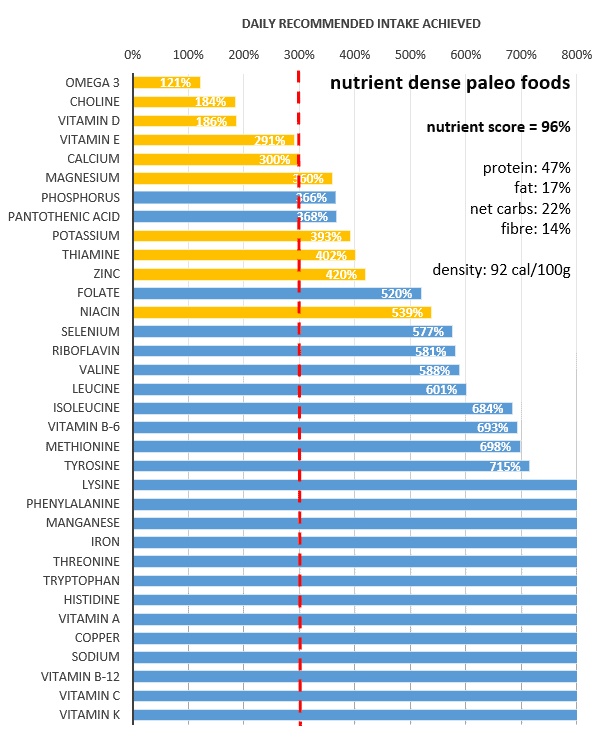 If your goal was just to maintain weight or fuel your endurance activities you could argue that such high a high level of nutrient density is excessive. You may end up fueling up with some more energy dense fat or refined carbs. However, maximising the nutrient : energy ratio of your diet would be very useful if you were trying to reduce your energy intake to lose weight. According to Bruce Ames’ Triage Theory, maximising nutrient density enables us to maximise both our short-term and long-term health and vitality. Perhaps with a higher nutrient : energy ratio, the body would be happier with a lower energy intake for longer without overwhelming cravings that may derail our weight loss efforts? 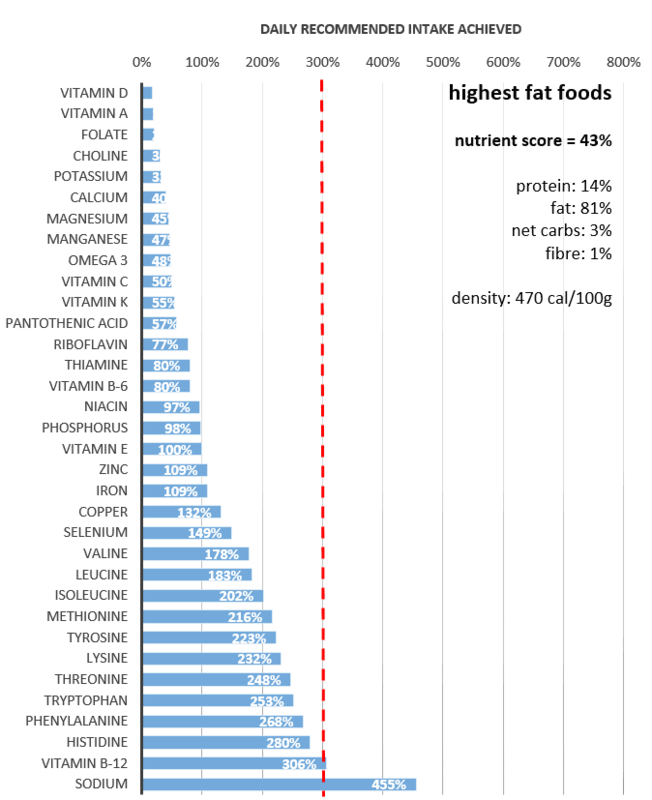 On the far right of the plot of protein vs nutrient density above we have the highest protein foods. Prioritising amino acids alone gives us a massive 77% of energy from protein! 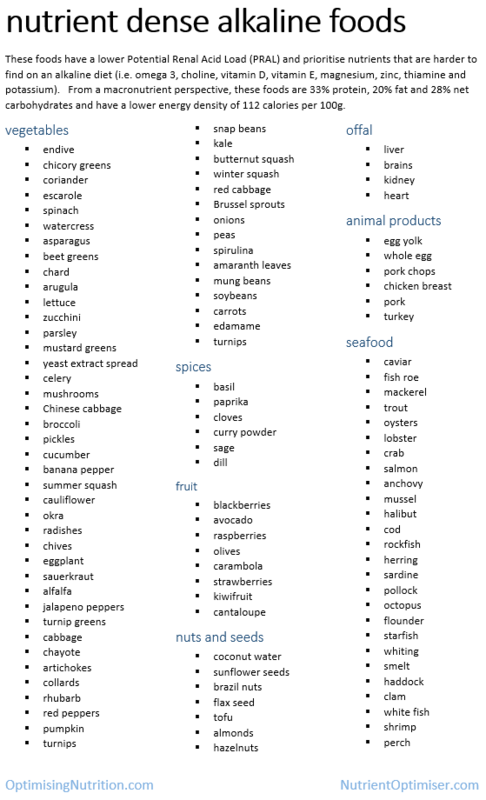 However, as you can see from the chart below, we will miss out on a number of essential vitamins and minerals (e.g. 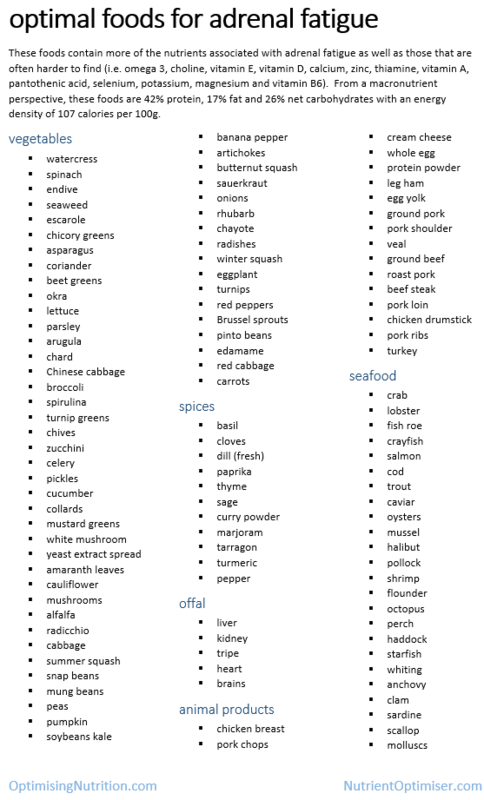 vitamin A, vitamin K, folate, manganese, vitamin D, calcium etc.). 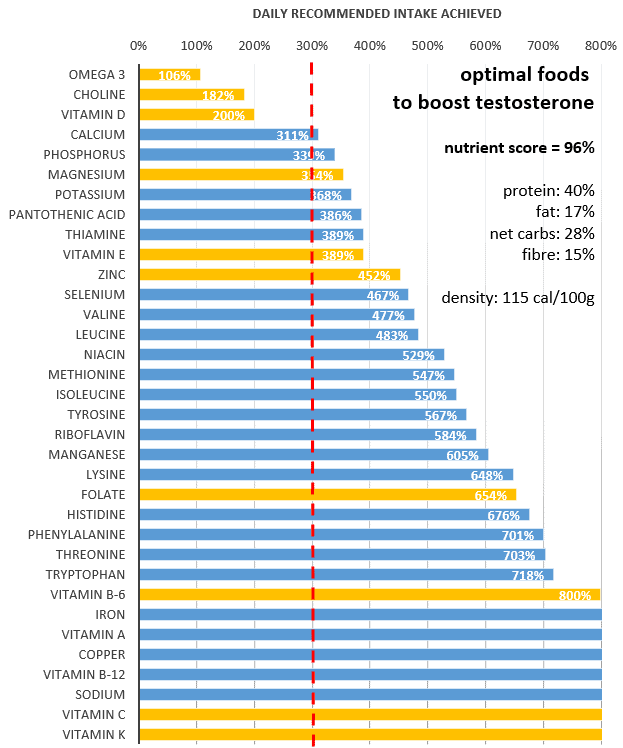 Just prioritising high protein foods doesn’t achieve optimal outcomes. We need to prioritise nutrients! 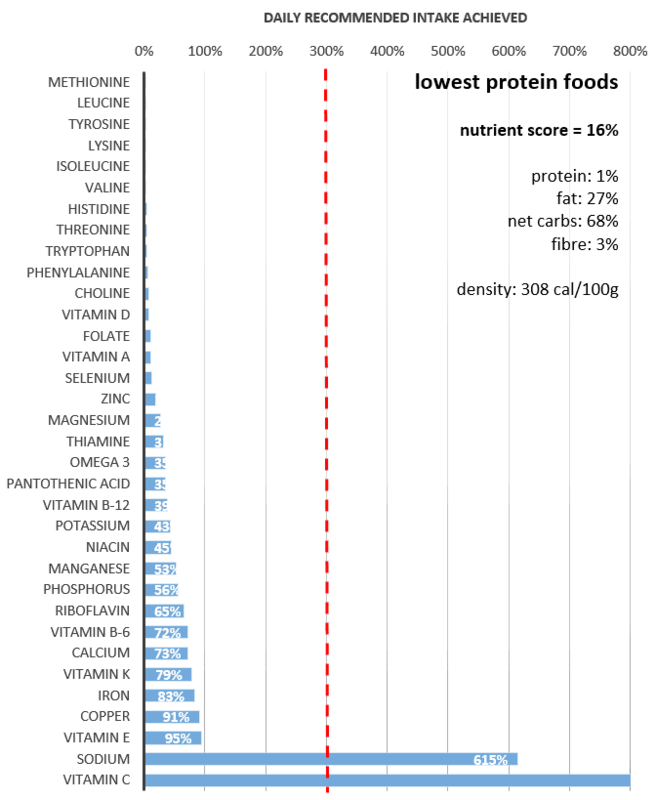 At the other extreme, the nutrient profile of the lowest protein foods is shown below. If we actively avoid protein, we end up with an inferior nutritional outcome. If there is such as thing as ‘too much protein’ we could say that it occur when we are getting more than half our energy intake from protein (which is hard to do!). Lately, a lot of people are concerned about reducing protein to minimise insulin and mTOR. 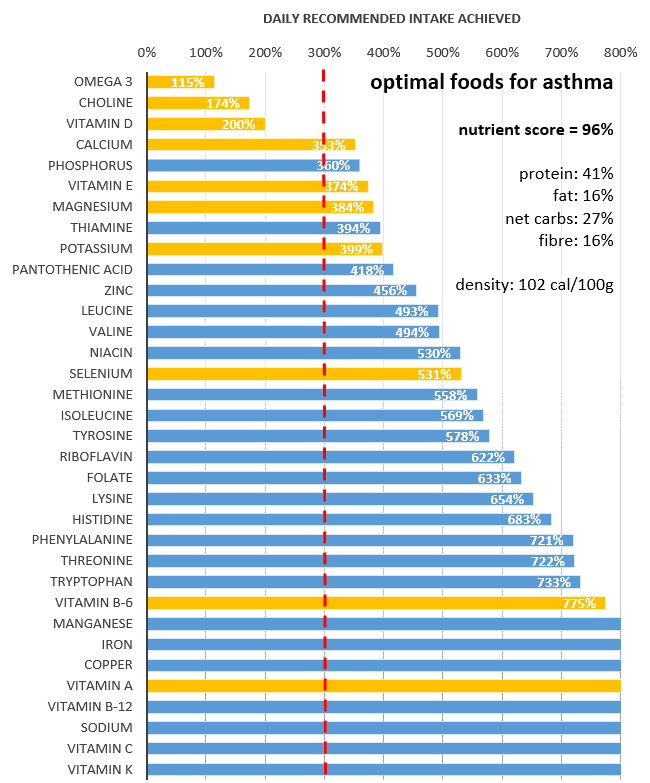 While chronically high overall energy intake is indeed a problem, I am concerned that an intentionally low protein dietary approach will have a very poor nutrient outcome. We then risk being driven to overeat in an effort to find nutrients that we are not getting from our low protein diet. As suggested by Ames’ Triage Theory, if we miss out on nutrients by prioritising low protein foods, our body diverts our nutrients to short-term survival rather than longevity. Pottenger’s cats suggest that our descendants will develop degenerative diseases, become lazy and eventually not be able to procreate due to our poor nutritional status. The most logical solution seems to be to increase our nutrient intake without overdoing energy intake. The ‘problem’ however with really high nutrient foods is that they, ironically, provide you with too much nutrition. 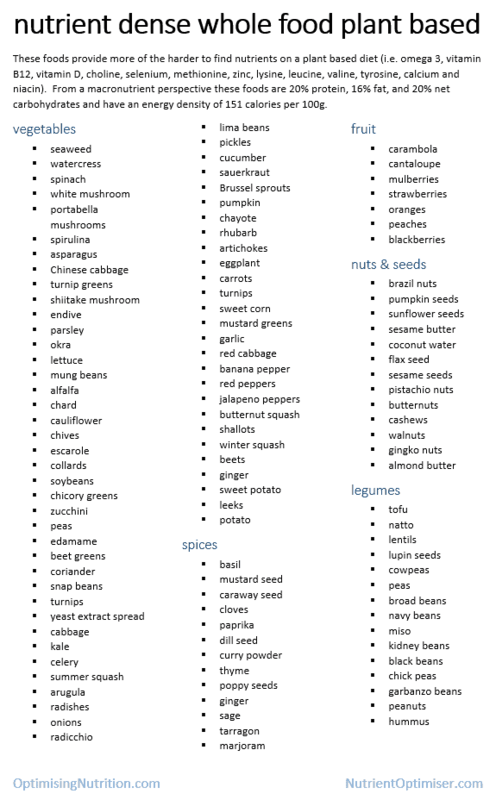 It’s hard to overeat highly nutrient-dense foods. Your appetite switches off and you will lose body fat. 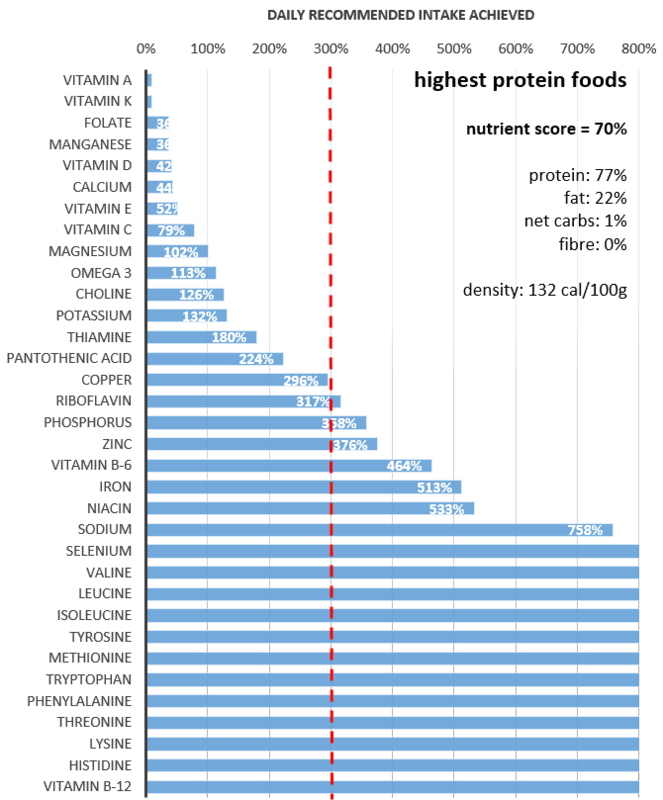 As shown in the chart below, it seems we have the lowest ad libitum energy intake when 40 to 50% of our energy comes from protein. 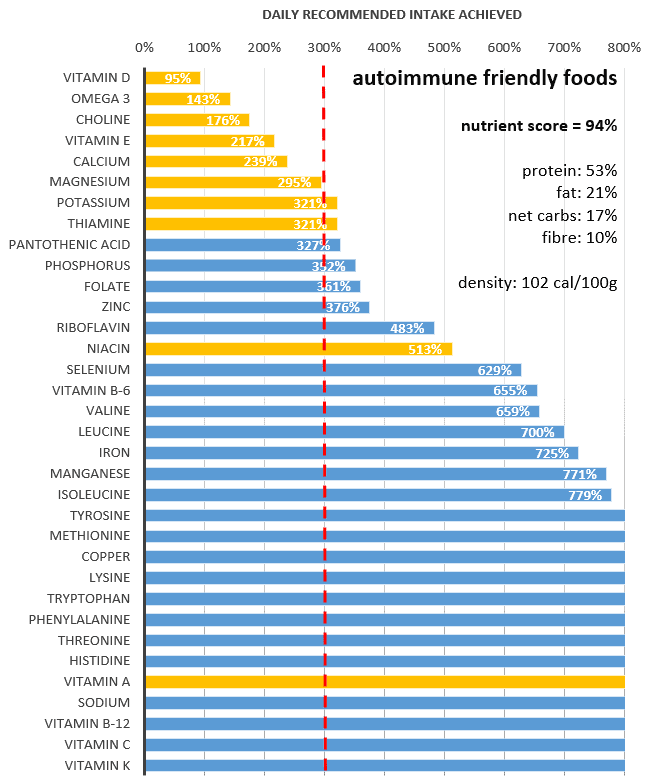 This seems to align with the highest nutrient density foods shown above. Excessively high levels of protein is not a good idea from an evolutionary perspective because protein is very satiating. We need the more energy-dense fat and carbs to fuel us to chase our food down and help us get in enough energy to store body fat to make it through the winter. However, forcing ‘rabbit starvation’ may be a useful hack if you have body fat to lose. For someone wanting to lose weight, a higher percentage of protein with a lower overall energy intake might be optimal. 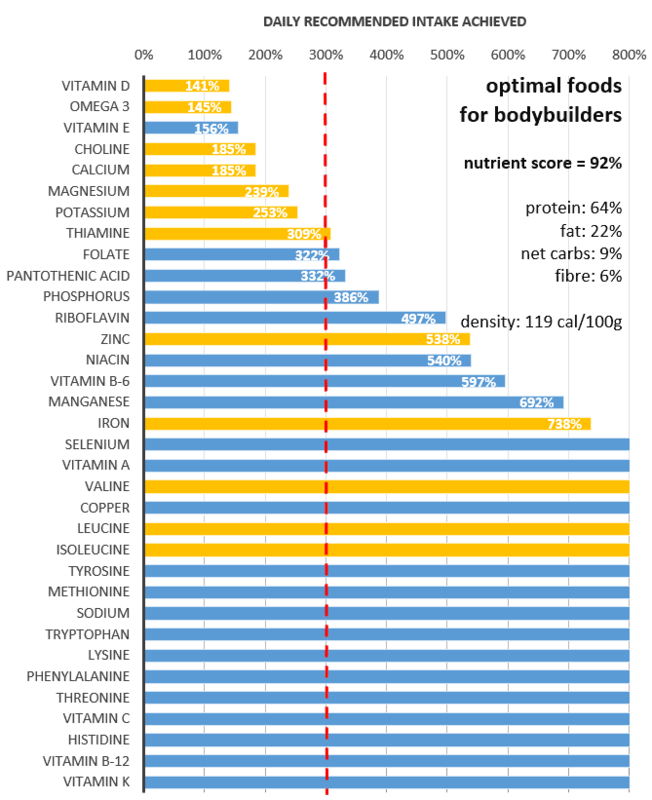 So is 40 to 50% protein optimal for everyone? Not necessarily! It depends on who you are and your goals. For most people, consuming a nutrient-dense diet will increase the proportion of energy from protein beyond the typical 16% intake. At the other extreme, it seems that increasing protein beyond 50% of energy intake would dilute nutrient density as well as be too satiating! When it comes to protein, the minimum effective dose is whatever comes with more nutrient-dense foods, but not so much that satiety kicks in so hard that you can’t maintain your body weight. The minimum effective dose appears to be around 19% of energy from protein with higher levels providing more overall nutrition. If you are active and need to consume a lot of energy, then the optimal 45% protein will be impractical. However, if you are aggressively cutting calories and eating a very nutrient-dense energy-restricted diet with a high nutrient : energy ratio then closer to 45% may be optimal. 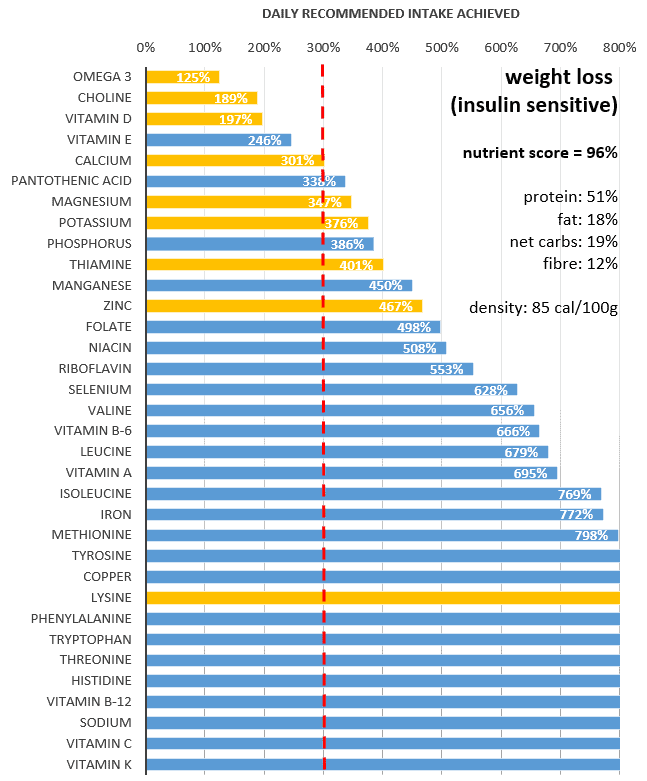 After protein, the parameter that is most correlated with nutrient density is insulin load. Insulin load is a proxy for the amount of insulin that our pancreas will need to produce and is proportional to the carbohydrates, minus fibre plus about half the protein. If you have diabetes, you need to invest your available insulin wisely. 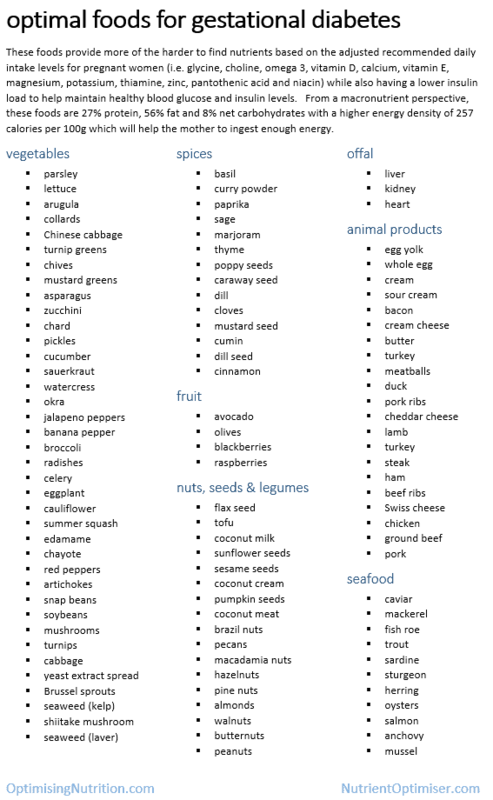 Consuming highly insulinogenic foods will make insulin dosing hard to calculate if you have Type 1 diabetes. People with Type 2 won’t have enough insulin to keep up to overcome their insulin resistance and maintain excellent blood sugars. Someone who already has diabetes will benefit by reducing the insulin load of their diet to help normalise their blood sugars, particularly if they have been overloading their pancreas with processed carbs and sugars. A typical western diet has about 60% or more insulinogenic calories. 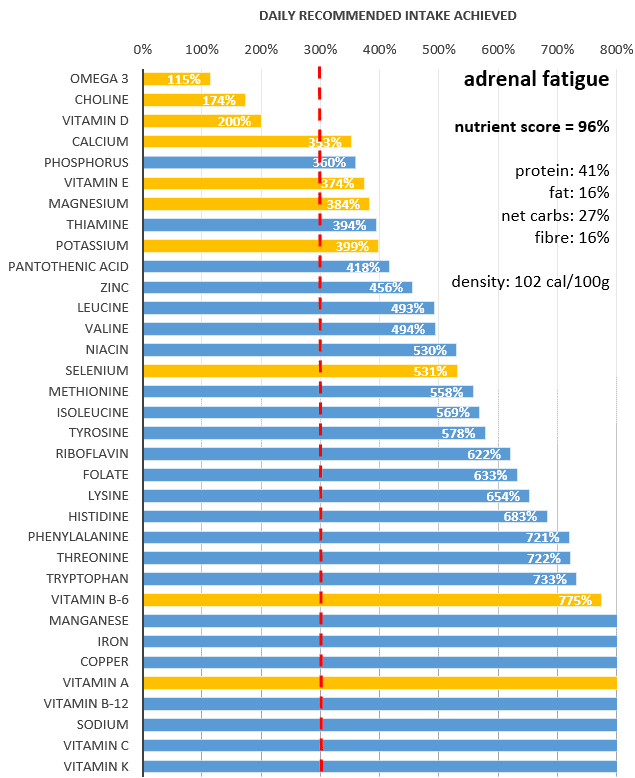 The chart below shows that we get the minimum effective dose (i.e. 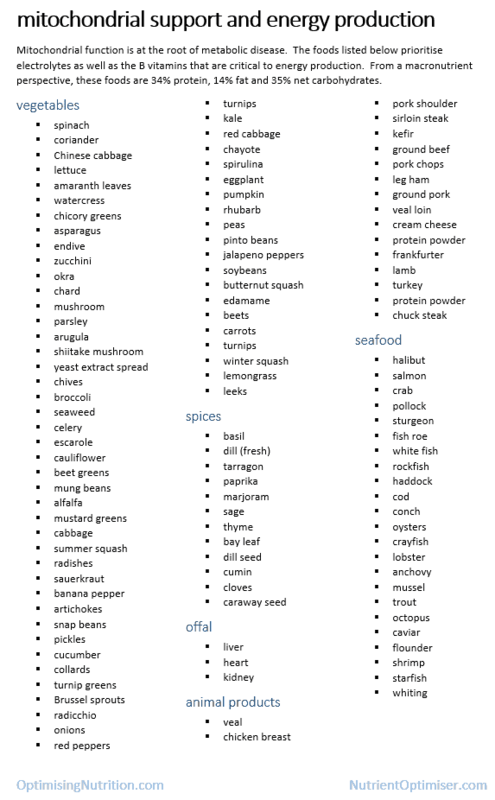 a nutrient density score of 70%) with an insulin load of 19%, optimal at around 41% of energy and an upper limit of 65%. Overall nutrient density starts to suffer outside these limits and we would have to pay more particular attention to our nutrition. The current typical macro intake suggests that we are 65% insulinogenic calories on average in non-Asian countries and 73% in Asian countries. And if this is typical it is likely that many people are consuming much more than this. Perhaps highly insulinogenic low nutrient density processed foods could be playing a role in the epidemic of diabesity? 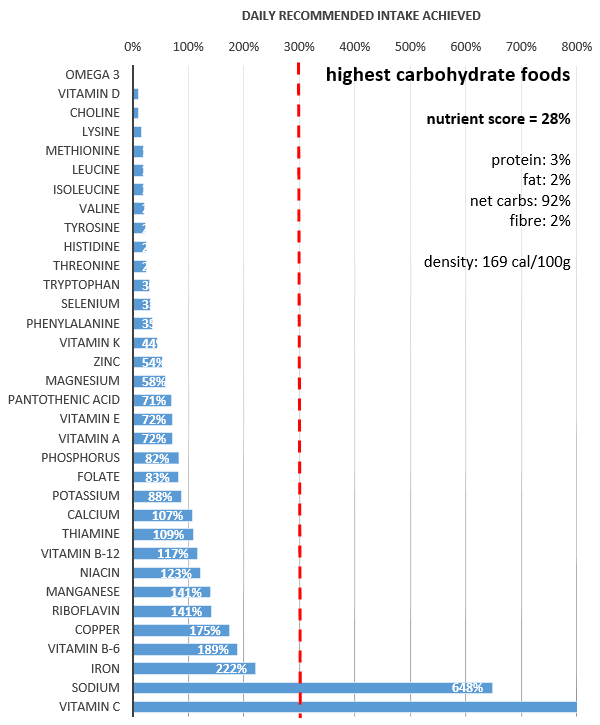 … and nutrient density vs net carbohydrates. It seems the minimum effective dose of net carbs is 0% and 8% in terms of total carbs with an optimal nutritional outcome at around 30% net carbs or 35% total carbs. The upper limit is 60% net carbs or 65% total carbs. This upper limit aligns with the official “Acceptable Macronutrient Distribution Range” for carbohydrates of 65%. What is worth noting here is that the typical intake is 55% which is greater than the optimal nutrient intake. The lower limit of the official AMDR is 45% which appears to be unnecessarily high, especially for someone who is not active or is already developing metabolic syndrome. Many people in low carb circles are fond of point out that ‘there is no such thing as an essential carbohydrate’. However, foods that contain essential vitamins and minerals also often come packaged with carbohydrates. 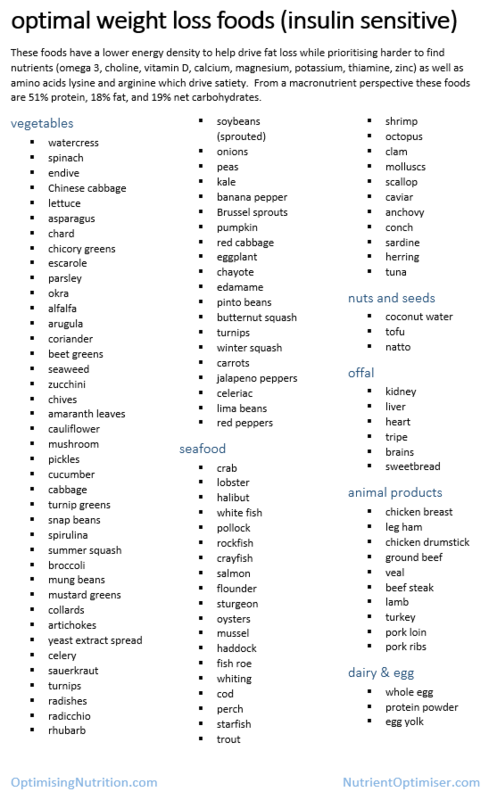 At the same time, you can also get plenty of vitamins and minerals from organ meats and shellfish if green leafy veggies aren’t your thing. If you already have diabetes you should lower your carbohydrate intake to the level that lets you achieve excellent blood sugar control. In order to control your blood sugars, you will need to reduce your carbohydrates to a level less than the typical level of 55% and most likely less than the optimal level of 30%. You can continue to refine your approach and ‘eat to your meter’ until you get the blood sugars you are chasing. However, unless you require therapeutic ketosis (i.e. 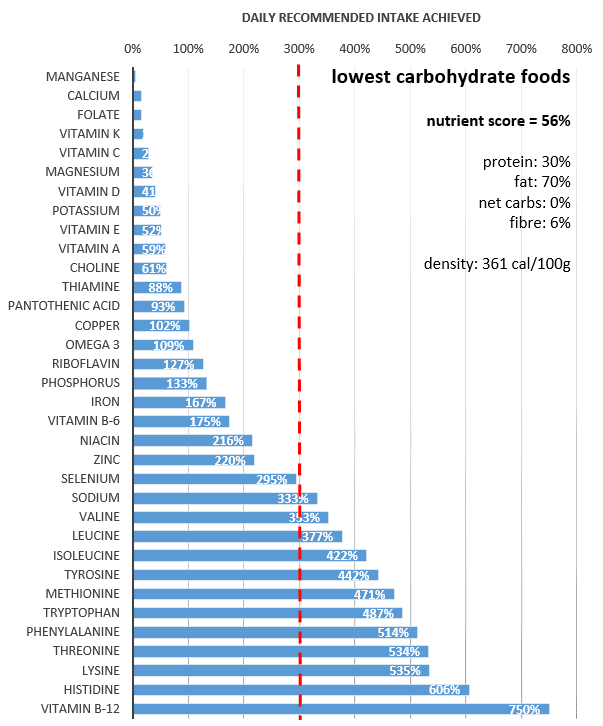 to manage chronic conditions such as cancer, epilepsy, dementia or Alzheimers), there is probably no need to drive carbohydrate intake much lower than 8% as you may struggle to obtain the broad range of essential nutrients. While there is a lot of talk about “high fat” or “low fat”, fat is actually a relatively poor predictor of nutrient density (R2 = 0.41). The minimum effective dose seems to set at around 10% of energy intake with an upper limit of 65% fat. Outside this window, it tends to be harder to get excellent nutrition. The average intake of fat in western diets is around 28%. 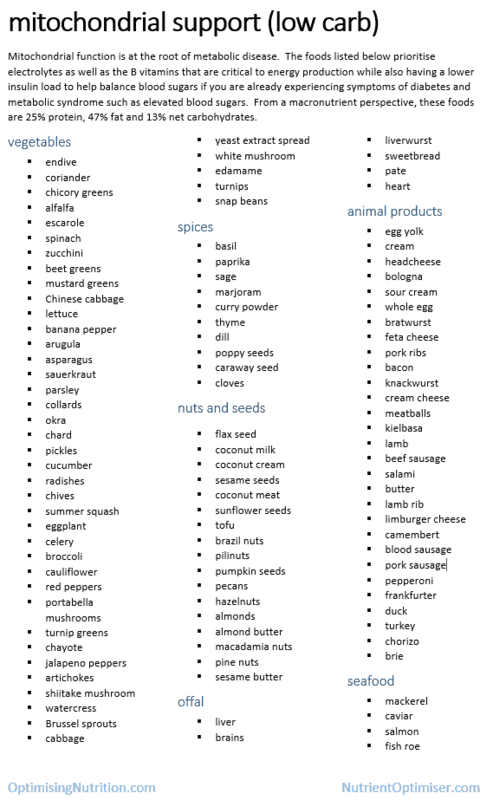 Most people would benefit from consuming more than, particularly if they are not trying to lose weight. However, there might not be any benefit in going over 65% of energy from fat, particularly if your primary goal is to lose body fat. If your goal is to control your blood sugar and insulin levels then increasing fat is probably a better option than increasing energy from carbs if you can’t fit any more protein in. Overall, I don’t think we need to target a specific fat or carb intake. In the days before we had refrigerators, we would naturally cycle our intakes seasonally between more carbs in summer and more fat in the winter. However, these days our macronutrient intake seems to be driven more by profit margins and shelf lives (i.e. 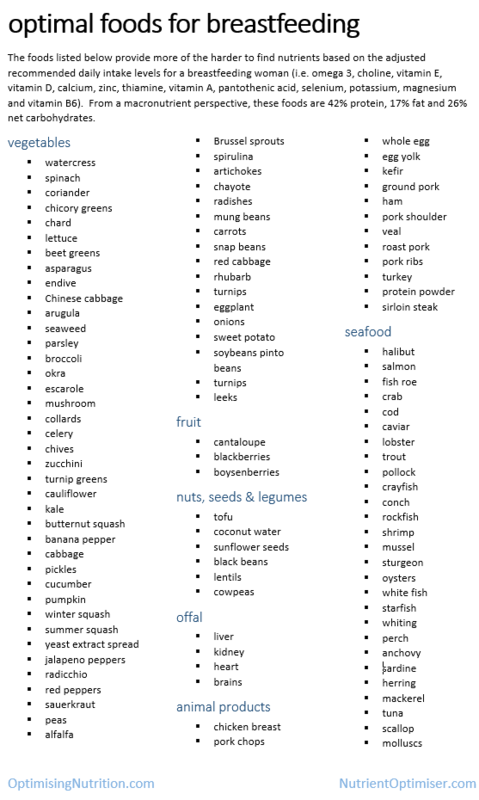 less protein and more refined fats and sugars) which keeps us in a higher carb summer-like phase. Foods with more fibre tend to be more nutritious and less process. I don’t think this is necessarily due to the fibre (i.e. 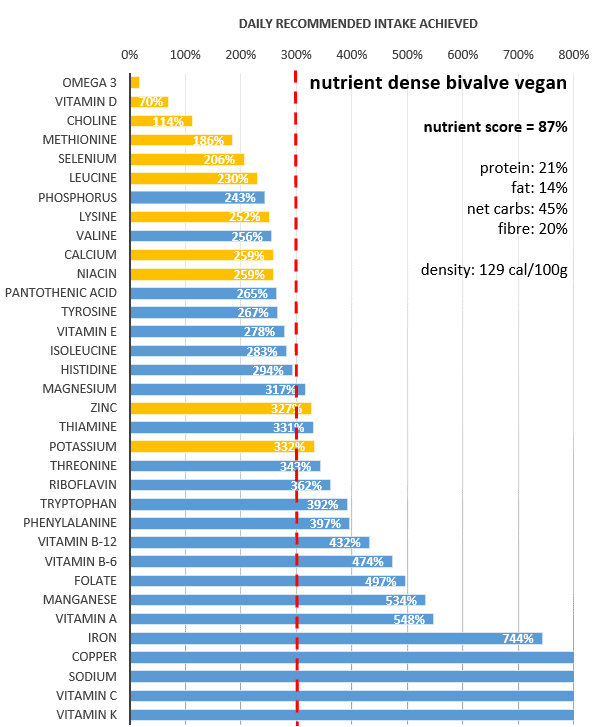 you may not benefit by loading up on fibre supplements), but rather because plant-based foods often have nutrients that are harder to find in animal-based foods. Some people seem to thrive on a zero carb diet, especially when switching from a processed high carb diet which can cause gut dysbiosis. 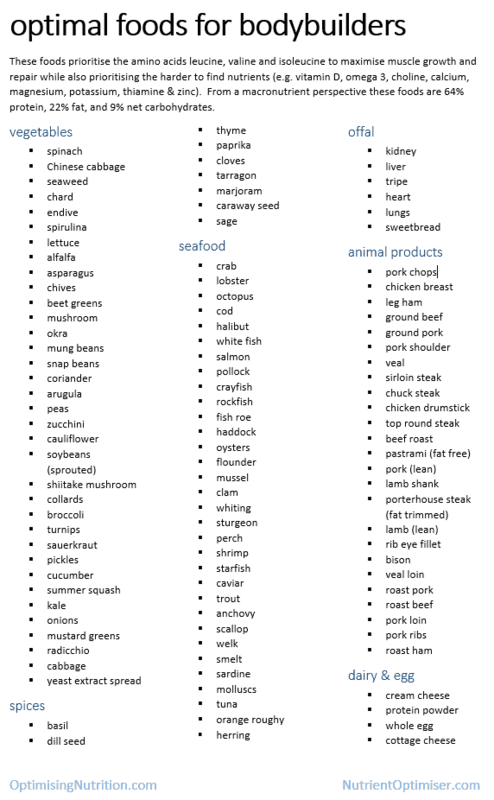 However, it can be challenging to get as much of the essential vitamins and minerals from a diet with no fibre (although if you are eating nose to tail including minerals from blood this may be another matter). 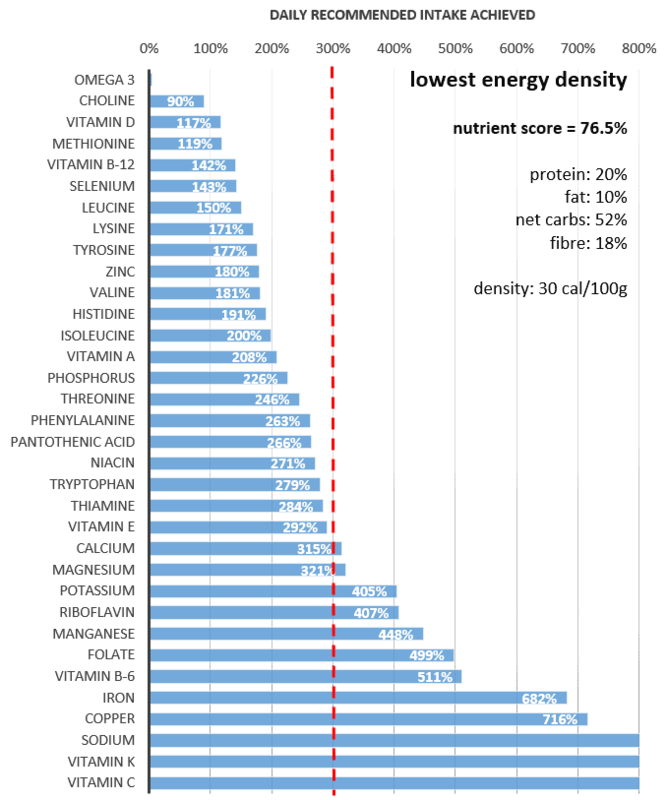 Energy density has the lowest correlation with nutrient density (R2 = 0.32). However, as a general rule, less energy-dense foods tend to more nutritious. Energy density can be a useful tool to help us identify foods that are more filling with less energy if we are looking to lose weight. Alternatively, we can look for higher energy-dense food that is still nutritious if we are looking to fuel high levels of activity. Another nutritional battle that seems to be raging is the plant-based versus carnivorous diets (i.e. no plants). The good thing about either extreme here is that they both generally eliminate highly processed foods. A whole food plant based dietary approach will remove processed junk foods and leave low energy density high fibre foods that will make it hard to lose weight. 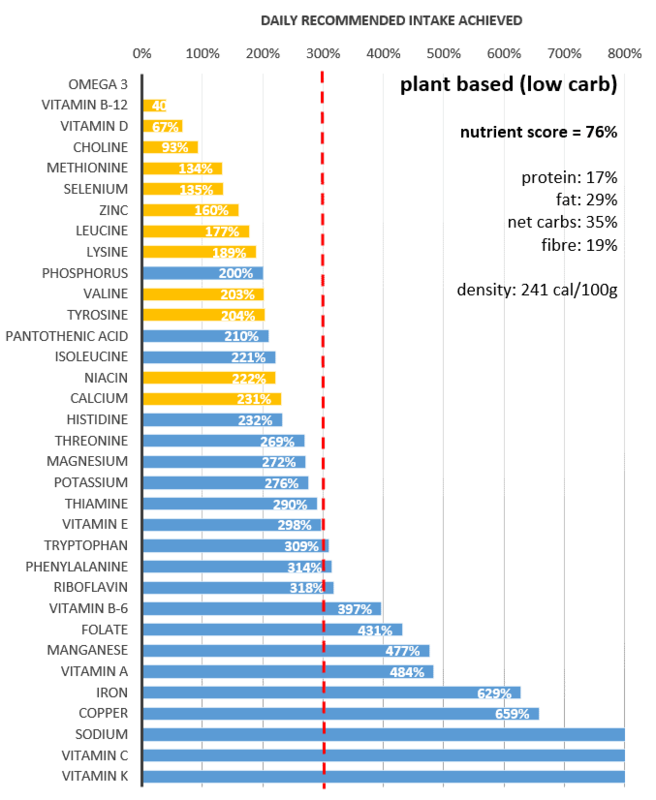 As you can see it is hard to get omega 3 or vitamin B12 on a plant-based diet there are a number of amino acids that are harder to get due to the amount in the plant-based foods and the bioavailability of plant-based proteins. 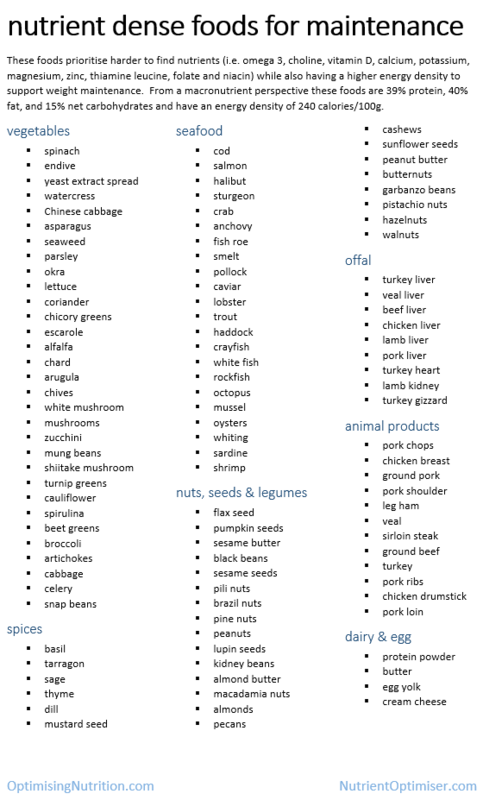 If you are consuming a diet that is predominantly plant-based you should look out for symptoms of deficiencies associated with omega 3, vitamin B12 and even protein and consider supplementing accordingly. 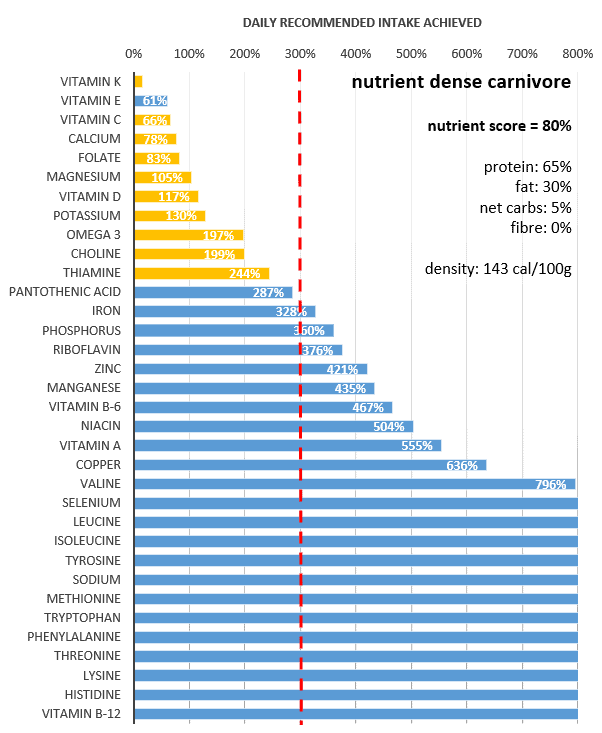 The chart below shows the micronutrient profile of a nutrient-dense carnivore diet. As you can see, there are a number of nutrients that are harder to obtain with this approach. However, there is some evidence to suggest that you may not need as much of some nutrients if you are not consuming as much glucose. 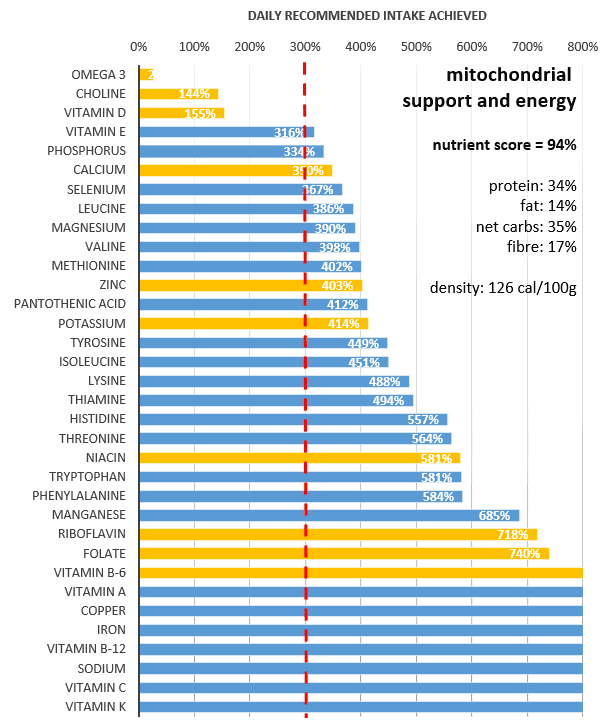 Again, understanding which nutrients you are not getting in large quantities may be useful to help you identify supplements or look out for symptoms. 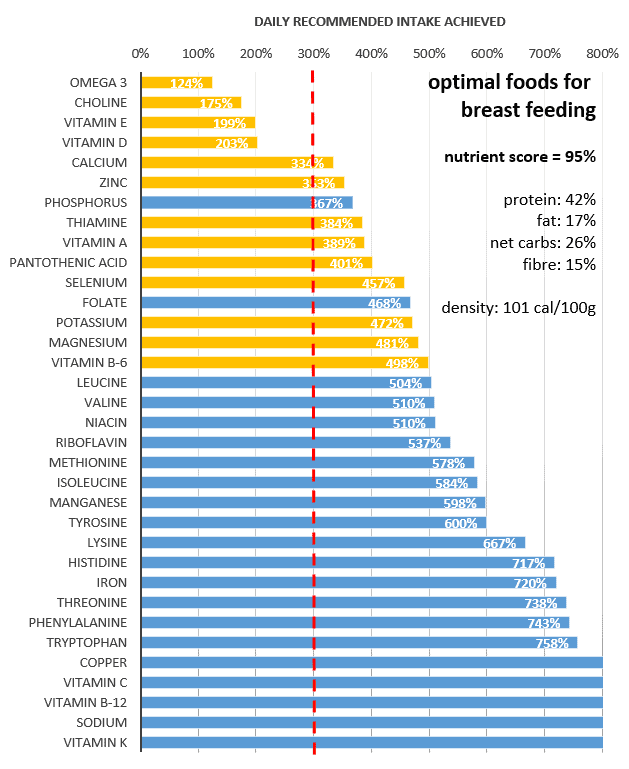 The table below shows suggested minimum effective dose, optimal and upper limit macronutrient splits along with the current intake levels for comparison. However, food doesn’t come in neat packages of carbs, fats and protein. Trying to increase protein by adding protein powder or fat by increasing butter or cream may not lead to an optimal nutritional outcome. But if you focus on meeting your micronutrient requirements with real food the macronutrients will typically look after themselves. * If you are astute you might notice that the optimal macros actually sum up to 116%. This is to be expected given that it is not a closed system. 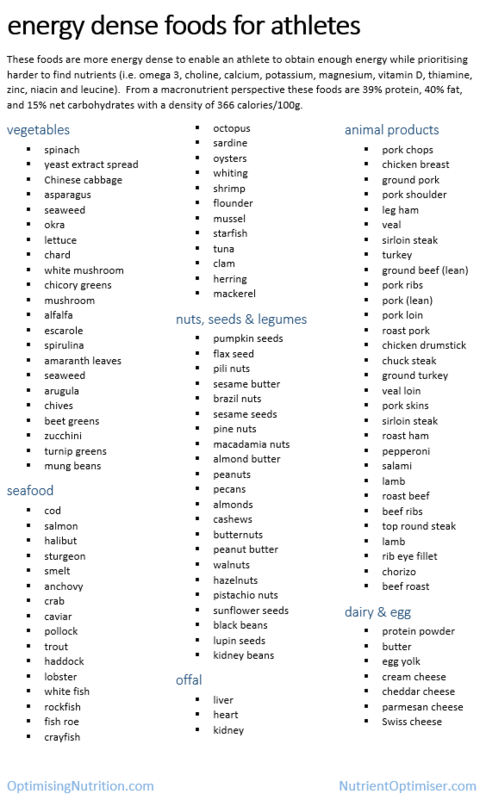 In reality, most people will struggle to consume “optimal” protein levels. As a general rule of thumb starting with a three-way split of protein, fat and carbs is a reasonable starting point if you insist in thinking in terms of macros. You can then make refinements from there to suit your goals (e.g. diabetes control, therapeutic keto, weight loss, athlete etc) and preferences (e.g. 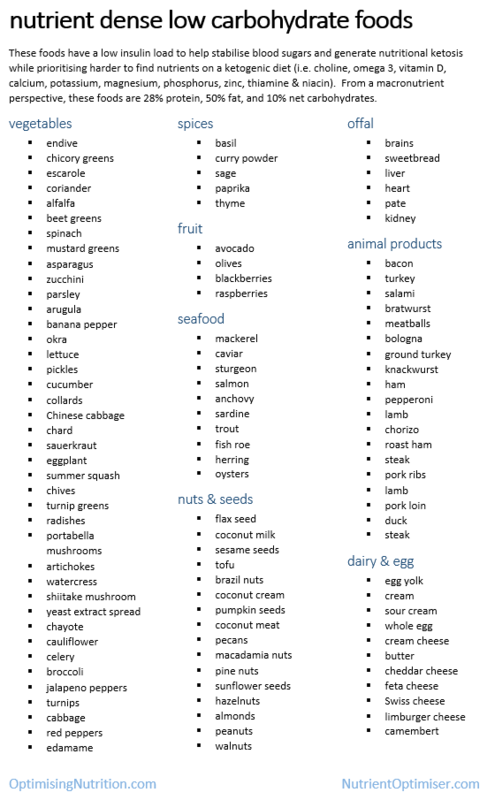 low carb, high carb, paleo, vegan etc). In the end, nutrition is about getting enough nutrients without too much energy. Percentages also don’t mean that much for a real person wanting to know what to eat. 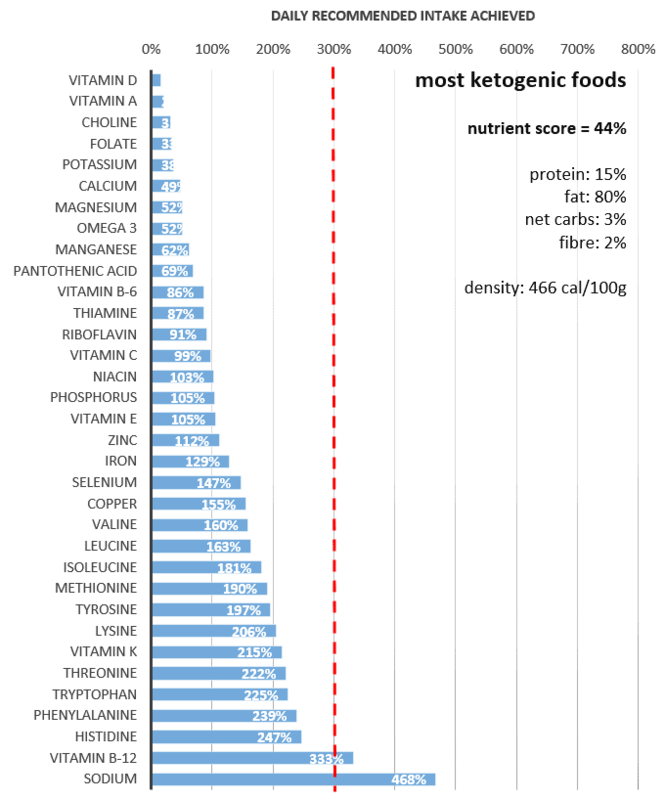 The table below shows you the minimum amount of each macronutrient you might need to also provide a solid level of nutrition in terms of your current lean body mass (i.e. total weight minus your fat) and grammes per kilo and grams per pound of LBM. These minimum levels will leave you with a shortfall of energy that you will have to make up from your body fat or other dietary inputs. There is endless debate about which diet is optimal and leads to longevity. However, the one thing that nearly everyone seems to agree on is that taking in too much energy is a problem. So erring on the side of less rather than more is going to be a good thing. 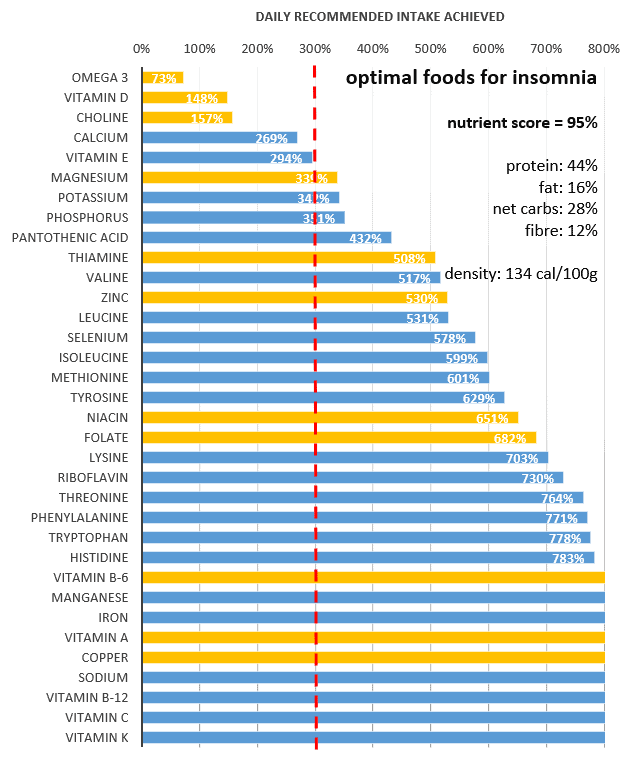 This table shows you the levels that you would need to hit the optimal nutritional outcome for each of these parameters. In practice, most people will find such high levels of protein difficult to consume and may end up making up any energy shortfall from body fat, dietary fat or dietary carbs. Nutrient density is important, however, it’s not the only thing. Most people will end up diluting their nutrient density somewhat in order to get in energy from higher fat or higher carb foods. 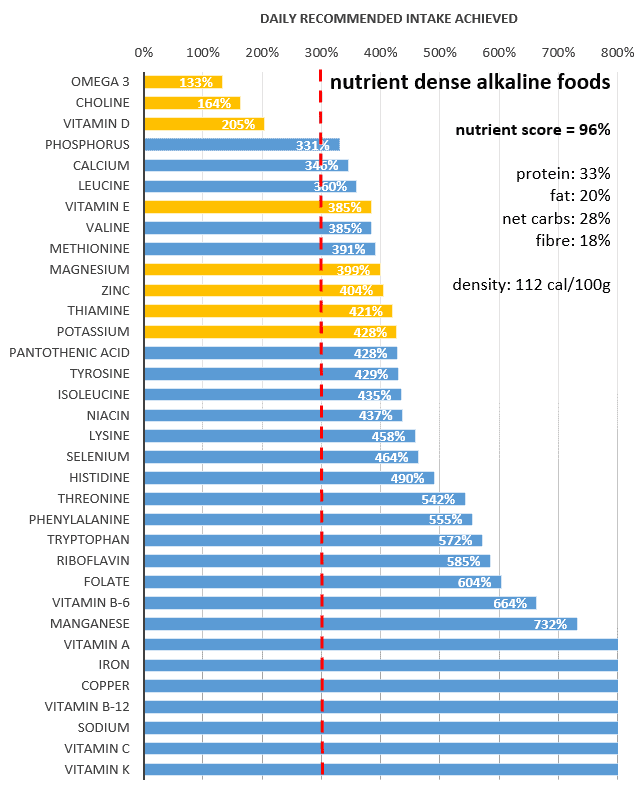 I could show the upper limit of each nutrient too, however, don’t think there’s much practical use precisely quantifying these amounts. If you are active then your appetite will increase to encourage you to get more food. If you are gaining unwanted weight then you probably need to back off the intake. 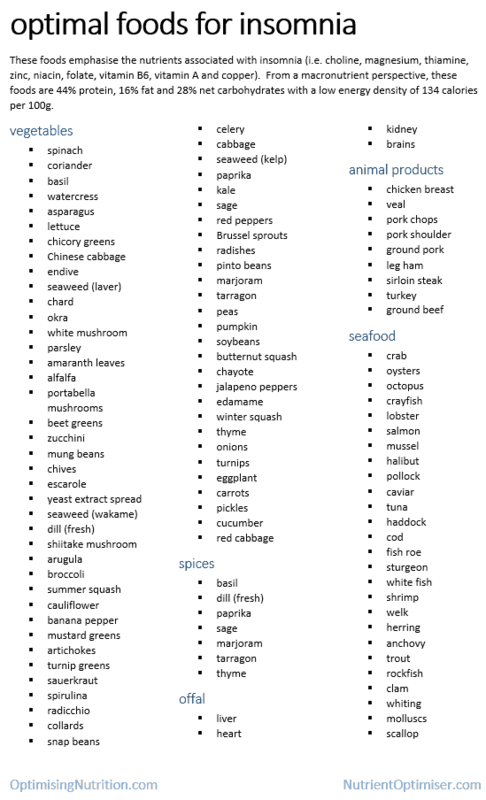 I encourage you to make use of the food lists in the table below. 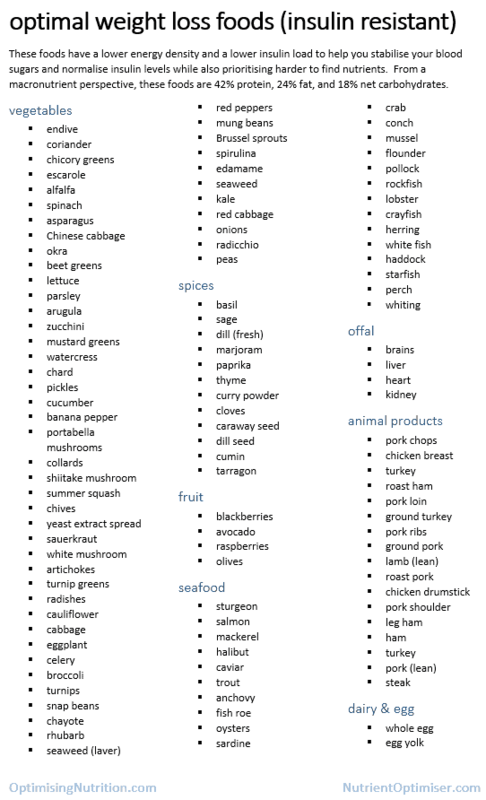 Click on the ‘foods’ hyperlink to open the food list as an image or the ‘pdf’ to download to print. 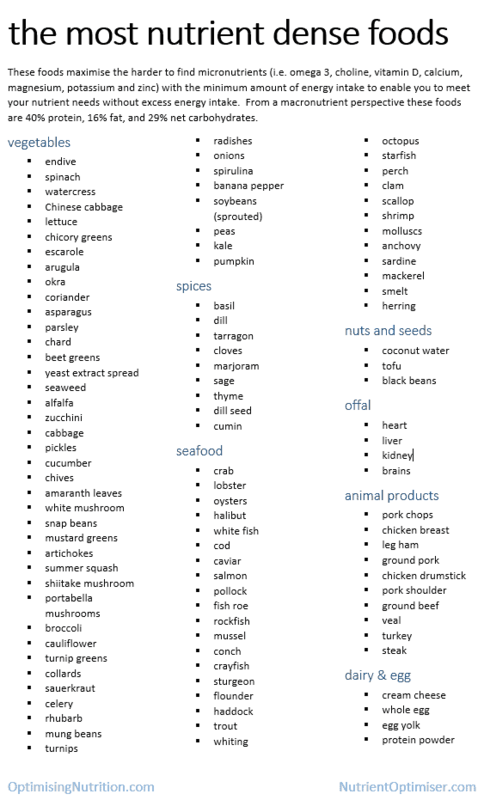 You can also check out the nutrient profile to see what nutrients these food lists contain and which nutrients have been profiled. 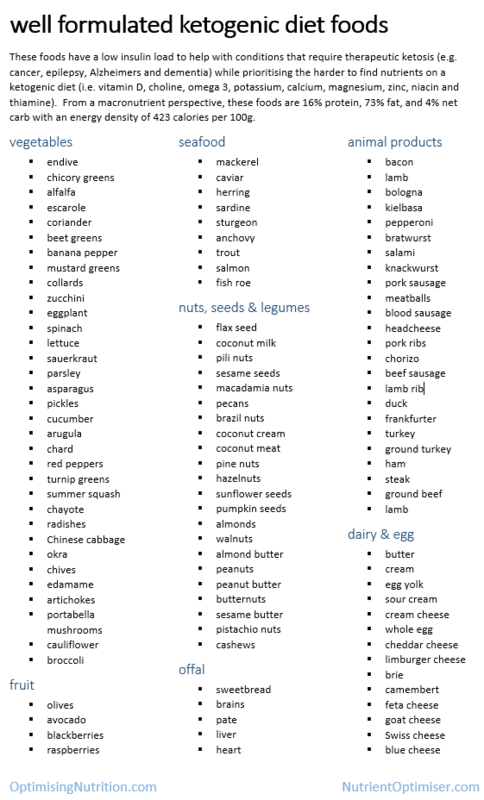 Once you reduce the nutrient-poor foods, you will be able to trust your appetite to guide you to the foods that contain the nutrients you need. 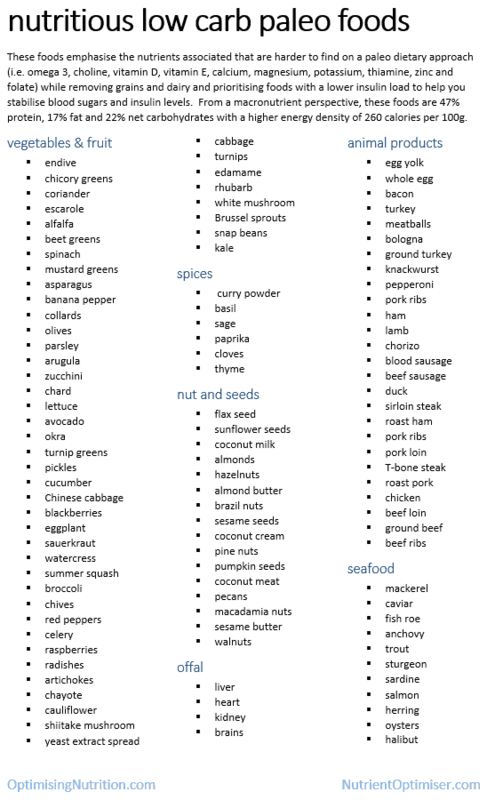 Once you feel you have got the hang of eating mostly nutrient dense foods, you may wish to use the Nutrient Optimiser to identify the nutrient gaps as the foods and meals that will help you optimise your nutrition. 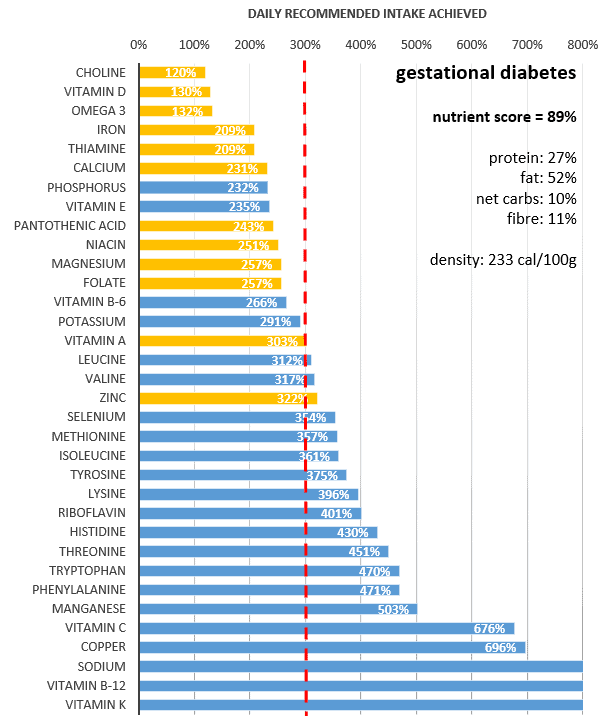 Note: we have not prioritised using Vitamin E and Pantothenic Acid due to the fact that the DRI targets are based on population averages rather than deficiency studies. Your content is always extremely helpful and painstakingly thorough! Thank you for providing the information you do. Hi Marty I appreciate the very useful information on effective nutritional doses. 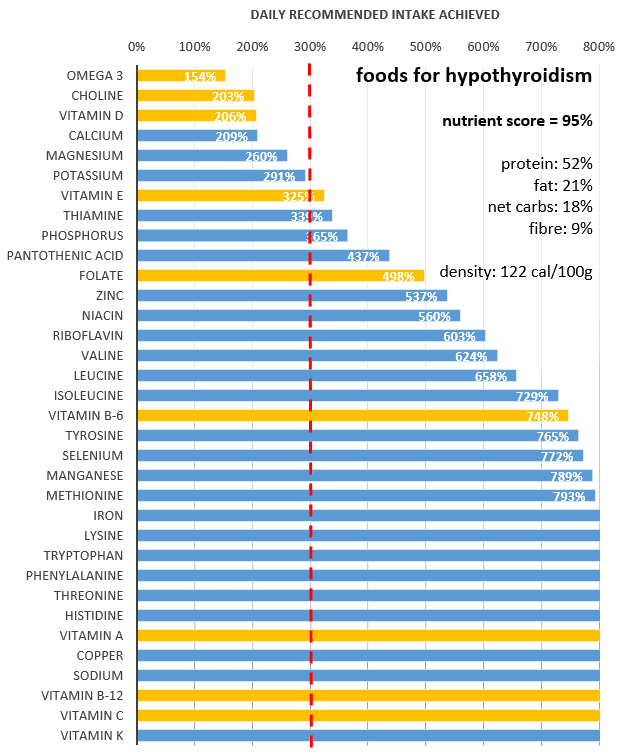 Can I ask if you could double check the links for hypothyroidism as I am especially interested in that topic. Thanks Mary. The links seem to be OK. Let me know if you think there is a specific issue. The paper that you cited above – https://www.ncbi.nlm.nih.gov/m/pubmed/16004827/ – actually states that the IOM calculated the healthy macronutrient distribution of proteins to be 10% – 35% and not 15% – 35% as you have inaccurately stated above. Please try not to misrepresent the facts. I suggest you check the other reference that I have quoted which says “On average, only 10% of energy is required to cover physiological needs, but this level is insufficient to allow for EARs for micronutrients when consuming foods commonly eaten in Australia and New Zealand. The chart implies that fat intake has decreased over the last 40 years, but in reality the amount of fat that Americans eat has increased. The amount of carbs and total calories has increased as well. We eat more calories of fat than ever before; fat intake (amount, not percentage) has been steadily increasing since data collection started 100 years ago. This chart also doesn’t show the whole picture. The data goes back 100 years. In 1909, carbs made up 57% of the diet, more than today and most of it was white flour. Americans weren’t fat. The lowest carb intake was in the 60’s and 70’s. This is why the chart you used looks so convincing yet leads to a conclusion actually unsupported by all the data. cheers. I will check out the extra research.